The Maryland Comprehensive Historic Preservation Plan includes six counties and Baltimore City in the Piedmont region. 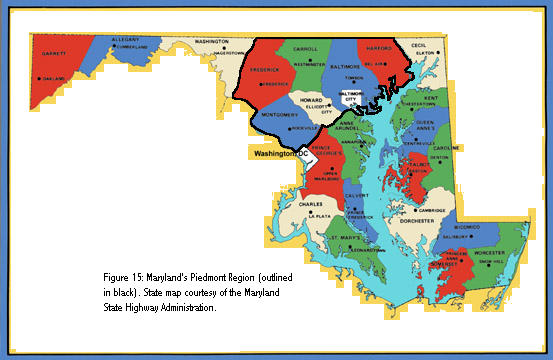 The counties are Frederick, Carroll, Montgomery, Howard, Baltimore and Harford. While many people are aware of the intense industrialization in Baltimore City and along the Patapsco River in Baltimore and Howard counties, they are not aware of the large amount of industry everywhere else in this region. The Piedmont consequently has some of the largest concentrations of industrial labor heritage in the state. As with the rest of Maryland (except western Allegany County), most of the Piedmont counties have been dependent on agriculture throughout their histories. The Piedmont climate was not conducive to tobacco cultivation, however, and here farmers switched to wheat and other crops before farmers on the Western and Eastern shores. Agricultural milling, of course, forms a large segment of the industrial legacy of the Piedmont, as does lime production. Other prominent industries included iron production, mining, quarrying and various manufacturing enterprises. Aside from milling, many laborers in the Piedmont region were immigrants or came from recently immigrated families. In earlier periods people of German descent, moving south from Pennsylvania, were prominent. Welsh and Irish immigrants made up an increasingly larger proportion of the labor force during the 19th century. In Baltimore City, as in many other East Coast cities in the U.S., Italian and Eastern European immigrants came to dominate the working classes during the late 19th and early 20th centuries. Finally, antebellum iron furnaces followed the general pattern in Maryland by using enslaved Africans and African-Americans. Industrial unionism became important in the Piedmont, especially in Baltimore City and Baltimore County, during the late 19th century and continued strongly into the 20th century. Baltimore City has seen numerous strikes throughout its history. Important unions have included the United Steelworkers, the United Autoworkers, the Amalgamated Clothing Workers of America, and the Industrial Workers of the World. Milling has been the dominant form of industry in Harford County throughout its history, but from its beginning it has milling has been more industrial than agricultural. It has been estimated that Harford County has been home to between 100 and possibly as many as 400 mills over the years. Merchant mills had sprung up in Harford County by the late 18th century, possibly due to their proximity to the major port of Baltimore. The villages of Monkton and Mill Green developed around large grist mills. The Jerusalem Mill Village, now a National Register site, included the grist mill, a miller’s house, a saw mill, a coppering and blacksmith shop, a gunsmith shop, a farm house, a general store, a post office, and mill workers’ dwellings. The Lower Deer Creek Valley and the Stafford vicinity were major centers of industry during this period. By the end of the 18th century, Deer Creek was lined with grist, saw, tanbark and flint mills, iron forges and furnaces and tanneries. One such industry was the Husband Flint Mill, opened during the first decade of the 19th century on the site of the earlier Nottingham Forge. This mill ground quartz for use in pottery and porcelain dishes. The labor force consisted of about 25 residents of the nearby free African-American community of Kalmia. Granite and gneiss quarries were opened in this area prior to the American Revolution. Stafford was founded around 1800 by John Stump III. Stafford had saw, grist, and slatting mills, an iron furnace, and a blacksmith’s shop. The Bush Creek Iron Works and the Cumberland Forge comprised one of the earliest industries in the county. Established in 1746, this business included corn and saw mills, a coal house, a blacksmith shop, and dwellings for the 13 slaves who worked here. The iron works had ceased operation by 1810. Up near the Pennsylvania border, in the vicinity of the present-day communities of Cardiff and Whiteford, slate quarries were being commercially mined by 1785. The villages of Lapidum and Rocks were both important warehouse and shipping centers during the late 18th century. Finally, a silk hat factory operated in Abingdon from about 1800 to 1820. Industry in Baltimore County during the period of Rural Agrarian Intensification was also dominated by milling, although not with the diversity of Harford County. One of the more famous milling concerns in early republic Maryland was Ellicott’s Mills, situated in southwest Baltimore County on the Patapsco River and on the border with what is now Howard County. In 1770 the Wilkins-Rogers Company built a grist mill on the site, and in 1792 the Ellicotts attached a flour mill to it. This flour mill is reputed to have been the first merchant flour mill in the U.S. The Ellicotts are important in Maryland history not just because they operated a number of very successful mills, but also because they were the primary proponents of the agricultural shift toward wheat and away from tobacco in 18th-century Maryland. In 1806 they added an iron works to the business, consisting of a rolling and slitting mill. The Ellicotts were also pioneers in the area of company-owned worker housing. Granite Hill, a long row of workers’ residences that is still extant, may have been built in the late 18th century. The village also contained a post office, a store and a school. Many of the laborers were, like the Ellicotts, Quakers who had migrated to Maryland from Pennsylvania. Another early mill village developed nearby in southwestern Baltimore as well. In 1809 an 800-spindle textile mill was opened by the Union Manufacturing Company, and the village was named Oella, according to the Oella Historic District National Register nomination, “in commemoration of the first woman who applied herself to the spinning of cotton on the continent of America.” By 1815, the end of the period of Rural Agrarian Intensification, the Oella mill had 5,000 spindles. The 1811-1812 diary of a British diplomat who visited the factory describes some of its working conditions. According to this diplomat, the factory employed 300 people (including children) who worked from sunrise to sunset. They were allowed one half hour for breakfast and a full hour for dinner. The company built stone and log houses for its workers during the first quarter of the 19th century. A paper mill was constructed at Marble Vale in the late 18th century. The other mills in Baltimore County at this time were mostly small, agricultural mills. A gristmill was constructed in Rockland in 1813, and downstream from this was a bleach works opened in 1810. The early iron industry in Maryland had at least three sizeable representatives from Baltimore County. Charles Ridgely built the Northampton Furnace north of Towson for Ridgely, Lux and Company around 1760, and the operation thrived into the early 19th century. Attached to Northampton were a merchant flour mill and a saw mill. The labor force at the Northampton Ironworks was in many ways representative of other colonial ironworks. The complex was located in a then-rural area close to water and abundant timber supply. The labor force could be divided into four basic classes, including enslaved laborers, indentured servants, hirelings and free laborers. Indentured servants were the largest group. All of the indentured servants at Northampton were British, with the majority being English. Enslaved laborers were the second largest group. Ridgely and the company owned separate enslaved populations, but both worked at the ironworks. Other small slaveholders also occasionally hired their slaves to the company. Indentured servants and slaves performed the least skilled work for the operation, such as woodcutting. Hirelings were a notch above indentured servants but below free laborers on the hierarchy, contracting themselves to the company for a certain period of time in exchange for a wage and certain provisions. Free laborers were often culled from the surrounding population on a seasonal basis. Many of these people were skilled artisans such as moulders. Northampton, like many early “iron plantations,” was more than just an industrial complex; it was also a community. Charles Ridgely’s wife was an important early convert to Methodism in colonial Maryland, and as a result a chapel was built for the ironworks laborers. In fact, the ironworkers, the Ridgelys and their upper-class neighbors met frequently for prayer and worship. This allowed the upper class to display their paternalism and their innate superiority (even though Methodism stressed people’s basic equality). Despite the fact that many of the Northampton Ironworks’ laborers were indentured or enslaved, labor unrest was not uncommon. Attempts to escape were frequent, if not often successful. Many of the enslaved laborers tried to escape into Baltimore, where they could easily blend in with the many free African-Americans in Fell’s Point. Irish indentured servants, the only workers known to attempt escape in groups, usually traveled west and north. Other forms of protest centered on workers’ customary rights, as when two slaves hired from another master left the ironworks complaining of rancid meat provisions. Overall, however, the division of labor at the ironworks (by both class and ethnicity) probably prevented the formation of group solidarity among the workers. The Gunpowder Iron Works, on Gunpowder Falls, began operation in 1759. Not much is known of the early years of this business. Dorseys Forge was founded in 1761 by Caleb Dorsey, an ironmaster who was also involved in several other iron forges and furnaces. Dorseys Forge was located on the north bank of the Patapsco River, just north of Howard County. A gristmill was also attached to this operation. Part of the property was leased to William Whetcroft in 1775, a silversmith who had contracted with Maryland to produce muskets. Whetcroft’s complex included a slitting mill. At least nine skilled slaves were working at Dorseys Forge in 1787, including forgemen, blacksmiths, a miller, a waggoner, a carpenter and a fineryman. Baltimore’s growth as an industrial city during the 18th century was largely due to its location as a prime shipping center on the Chesapeake Bay. Beginning with tobacco and then wheat, many of northern and western Maryland’s farmers and millers shipped their produce to Baltimore to be exported. As people began to cluster around this port, related industries such as shipbuilding and wharf construction also arose. South of the city, the Westport district became the home of several iron furnaces, glass manufactories and textile and paper mills during the mid-18th century. The Baltimore Ironworks, located on the Gwynns Falls, was founded in 1731 by several prominent Maryland aristocrats, including three members of the Carroll family and Daniel Dulaney. Unlike many other early Maryland ironworks, this was owned and operated locally, rather than from Britain. The first forge was not actually put into blast until 1738, but by 1764 the operation included furnaces, two forges (and a third under construction), and 150 enslaved laborers. Jobs practiced by these workers included founding, keeping, men to keep the furnace in blast, men to supply it with ore and charcoal, men to crush and burn the ore, miners, colliers, woodcutters, farm hands (the company also cultivated a substantial amount of land to provide for its laborers), blacksmiths, wheelwrights, carpenters, and cooks. Free and indentured white laborers were also employed. Medical care for enslaved laborers was provided by the company. One of the first industrial areas of Baltimore was the Federal Hill vicinity. During the late 18th century Federal Hill, on the southwest side of Baltimore’s harbor, became a hotbed of the shipping and seafaring trades. Production of glass, brick and pottery also began in this area in the late 1700s. Across the harbor in the Fell’s Point District, shipping, warehouses and shipbuilding all provided employment for a large number of people, including both enslaved and free African-Americans. The Camden Yards area to the west was primarily rural during this period, but was home to several brickyards as well. On Lombard Street, north of the harbor, the Claggett Brewery opened. In the northeastern section of town, the area around Gay Street in Jonestown was populated mostly by working-class artisans, including flour millers, blacksmiths, stay makers, tanners and brass founders. The northern part of the present-day city, which was then an outlying area, provided water-power for milling through Gwynns Falls and Jones Falls. In 1790 a row of six houses was constructed in what became Dickeyville, for the workers at the Tschudi Mill. In 1811 this operation became the Franklin Paper Mill. Howard County was one of the last counties to be formed in Maryland, being separated from Anne Arundel County in 1851. Howard County has seen a great deal of industry and labor in its history. The Patapsco River has provided power for milling operations since this area was first settled by Europeans. Ellicott City sits on the site where the Ellicott family made milling a big business toward the end of the 18th century. The first traces of industrialization appeared in other areas such as Guilford and Simpsonville, but would not blossom until the period of Agricultural-Industrial Transition. In addition to the area that would become Ellicott City, the Elkridge area developed industry at an early date. Caleb Dorsey, Edward Dorsey and Alexander Lawson built an iron furnace here in 1755. This plant melted ore to produce pigs for work at a forge. Nearby, the Hockley Forge was constructed under the direction of Charles Carroll of Carrollton in 1760. By the late 1790s the complex included a grist and saw mill, a slitting mill with a blacksmith shop attached, and a nail factory. Many of the laborers were slaves. The idyllic rolling hills of Carroll County belie its industrial past. Carroll County was created from parts of Frederick and Baltimore counties in 1837. Mining, canning, tanning, milling, lime production and railroad construction are the major industries that have been located in Carroll County. Early industry in Carroll County was primarily confined to milling. By the end of the 18th century there were an estimated 31 mills in the county. The village of Detour grew around a complex that included a grist, a woolen and a saw mill, all constructed in the 1790s. Bachman’s Mills became a small crossroads in the early 19th century when the Bachman family bought a grist mill and donated land for the construction of a church nearby. It was not long before a schoolhouse and a store were added as well. A number of other small custom mills were constructed during the late 18th century, but many of them failed to attract a village until the period of Agricultural-Industrial Transition. Avondale is a small community just outside of Westminster with an interesting legend. Leigh Master built an iron foundry here around 1765 and used slave labor to operate it. Thomas Scharf, the prolific 19th-century author of Maryland county histories, relates the tale that Master’s ghost haunts the hills around Avondale begging forgiveness for a horrible misdeed. It is rumored that he once killed a slave that he disliked and threw the body into the furnace while it was in blast, in order to hide the evidence. Whether or not this actually happened is not known. Westminster, which eventually became the county seat, owed much of its early prosperity to tanning; four of the first lots laid out in town were the home and tanyard of Jacob Yingling. An iron foundry was established there in the early 19th century. Taneytown was the center of a diverse array of industries in the late 18th century. These included a tool manufactory (which burned in 1799), a hat factory, a pottery, tan yards and a brick-making business. In the early 19th century a marble yard was opened. Near Middlesburg, copper was mined during the 1740s. Surrounded by the primarily agricultural Carroll, Montgomery and Washington counties, Frederick County has seen its share of farming. Nevertheless, it has also been one of the most industrialized counties in Maryland throughout its history. Milling, tanning, iron production, lime production and glass-making have all been important to the county’s economic base. The area around Sugarloaf Mountain saw a flurry of early industrial activity. The Johnson family moved to Frederick County in the 1770s, where they quickly became iron entrepreneurs. The Johnson Furnace was very important during the Revolutionary War, supplying the Continental Army with firearms. The labor used to operate the furnace came from primarily free and enslaved African-Americans. The Johnson brothers also established the Bloomsbury Forge, the Furnace Branch Furnace, the Bennett Creek Forge, the Bush Creek Forge, and Catoctin Furnace, all in Frederick County. With the exception of Catoctin Furnace, these enterprises were defunct by 1815. Catoctin Furnace was one of the longest-operating iron furnaces in Maryland. Established in 1774 by the Johnson brothers about 12 miles northwest of Frederick, Catoctin was originally a self-sufficient community. Dwellings were constructed for the laborers and for the overseers. Many of the laborers were first- or second-generation slaves who brought iron-working skills and traditions with them from West Africa. Not much is known about their lives outside of the time they spent working for the furnace, but skeletal analysis of remains from a partially exhumed cemetery indicates hard work, poor childhood health and a coarse diet. Nearby Johann Friedrich Amelung, a German glassmaker, set up the Amelung Glass Factory around 1785. Amelung brought 68 experienced glass workers with him when he immigrated to the United States, and fourteen more came shortly thereafter. By 1790 the operation employed between 400 and 500 people. Amelung built single-family housing for his workers, though not in a uniform architectural style or on a street grid. He also built at least two schools for his employees’ children. He called his village New Bremen, after the site of his origin in Germany. Amelung glass quickly became very popular, but financial troubles forced Amelung to close the factory in 1795. Another glass factory, the Mt. Etna Glass Works, was in operation around the same time north of Frederick. Many of the laborers from the Amelung Factory stayed in the area after the business closed. Some went to work at the nearby Kohlenberg Glass Factory (partly owned by Amelung’s son) or the Bush Creek Forge. A number of them, however, established the Fleecy Dale Woolen Factory and Ordeman’s Distillery in 1810, at one point employing 10 men, 14 women and 15 children. Creagerstown was another early industrial village in Frederick County. Established as a crossroads village in 1775, the village became home to a large tannery in 1785. A German brewery was built in 1807, but the tannery closed in 1810. Thurmont was also originally just a crossroads community, but eventually it became one of the three largest towns in Frederick County. During the late 18th century it was known as Mechanicstown for the large number of blacksmiths and mechanics who resided there. Early 19th-century industries included a tool factory, a woolen mill, tanneries and a match factory. Agricultural milling was a major industry in early Frederick County. It has been estimated that there were over 80 grist mills on the Monocacy River alone in 1791, and that there have been over 400 throughout the county’s history. Villages grew up during the late 18th and early 19th centuries around Kinna’s Mill, Black’s Mill, the Lewis Mill, the Brunswick Mill, the Benjamin Rice Mill, the Bowlus Flour Mill in Spoolsville, the Dorsey Mill in New London, Michael’s Mill near Buckeystown, the Doubs Mill (supposedly built by Charles Carroll of Carrollton in 1812), the Harrisville Mill, the Ceresville Flour Mill and the Spring Plains Mills. All of these were grist, saw or flour mills, or some combination thereof. Other minor industries that appeared were quarrying, lime burning and brick making. A stone quarry was opened near Ceresville in 1810. Buckeystown became home to the Thomas Brickyards in the late 18th century, and a lime kiln was constructed nearby around 1800. Industry in early Montgomery County, as in other Maryland counties, was primarily in the form of milling. Several small agricultural mills became the raison d’etre for crossroads communities, which in turn became industrial villages. Compared to other counties in the Piedmont region, however, industry never became as important in Montgomery County as elsewhere. Hyattstown developed around a mill that was built sometime between 1783 and 1798. In Brookeville, a fulling mill was in operation by at least 1793, and a second mill and a tan yard were built early in the 1800s. A grist mill was established in Triadelphia in 1809 or 1810. A bone mill for fertilizer production was built in Clarksburg in the first years of the 19th century. The Dufief Mill in Darnestown was built sometime around the turn of the century. Other mills sprang up in Germantown, Kensington, Potomac and near Boyds and Rockville, among other places. Sandstone and marble quarrying were the prominent industries in the Seneca area during the late 18th and early 19th centuries. The first quarries were opened in the 1780s to provide stone for a skirting canal along the Great Falls of the Potomac River. In the early 19th century red sandstone and marble became popular, and many government buildings in Washington D.C. have some Seneca sandstone or marble in them. During the period of Agricultural-Industrial Transition industrial milling continued to be a force in Harford County. Saw and cider mills were added to the existing stock in Mill Green. In the Lower Deer Creek Valley the village of Cookville was developed by Elisha Cook. After failing at a woolen mill, Cook opened a successful tannery and tanbark mill in 1842. The Cook family also owned the community’s school and store. In the Stafford industrial area a flint and bone mill was constructed in 1850. The Husband Flint Mill continued to thrive, and some quarry pits from this period can still be seen nearby. The inhabitants of Kalmia also established a chapel and cemetery during this time. The Jerusalem mill village gained a general store and post office. The Whitaker Mill near Bel Air was constructed, and it eventually became one of the most productive mills in the entire county. The N.S. Bemis Mill near Mill Green was built in 1827, and soon included a forge and a tavern. In 1857 a grist mill was built in Chrome Valley, but by the late 1860s it was a part of the operations of the Baltimore Chrome Mining Company. Shipping also continued to thrive during this period. The LaGrange Warehouse in Rocks employed as many as 300 men at one point, and the owners of the business, the Rogers family, also built a schoolhouse, an icehouse, a smokehouse and a blacksmith and wheelwright shop. Havre de Grace, which had been founded in the 18th century, became more than just a political center when it became a prominent shipping entrepôt. The town had coal and ice wharves and a shipyard. The first half of the period of Agricultural-Industrial Transition saw the zenith of the iron industry in Harford County. The Deer Creek Iron Works was established in the middle of the century employing African-Americans from Kalmia. The Sarah Furnace was constructed in the Jarrettsville vicinity around the same time. This furnace produced pig iron. The village that developed around Sarah Furnace included at least five houses, a store, a post office, a cobbler shop, a blacksmith shop and a school. The Harford Furnace was constructed around 1830 near the site of the old Bush Creek Iron Works, and operated until the 1860s. A village grew up around the furnace, which at its largest consisted of 48 buildings or structures. These included a store and post office, a blacksmith shop, a lime kiln, a sawmill, warehouses, and workers’ dwellings. After the Civil War the iron works was converted to a chemical plant to produce pyroligneus acid, but it closed down for good in the early 1870s. During this period in Baltimore County, the iron industry expanded, manufacturing mills became even more numerous, and other industries such as quarrying, lime production and powder production appeared on the scene. In general, the county experienced an industrial florescence that has seldom been matched in Maryland’s history. By the 1830s the Ellicotts had hit financial difficulties and sold their mills. The rolling and slitting mill was replaced around the middle of the 19th century by a textile mill, the Granite Hill Factory, which employed around 150 people (mostly women) in 1850. The Ellicotts’ main merchant grist mill had been replaced by another owned by the Patapsco Company in the 1830s. These changes were part of a general pattern of industrial change wherein large milling concerns went from being owner-operated to being investor-owned. In 1815 the mill in Oella had expanded to 5,000 spindles, and in 1819 it acquired power looms. In 1822 an additional mill was built that contained 150 power looms and 7,000 spindles, making the Union Manufacturing Company the largest textile company outside of New England. At this time the mills employed 10 men, 16 boys and 104 women. Before the end of the period Oella had 80 tenements for workers, machine houses, smith shops, a grist mill, a school and a boarding house for apprentices in the mill. The Union Manufacturing Company closed in 1834 due to overproduction, but in the 1840s the Granite Hill Factory took its place. By 1850 150 people were employed in the Granite Hill Factory. During this period the companies built workers’ dwellings out of brick. In 1823 a mill in Ilchester was purchased by Scottish immigrant brothers from the Ellicott family. By 1825 they had opened a cotton textile and cotton print mill called Thistle Factory. The owners built housing for their primarily Welsh workers. In addition to cotton print, the factory made silk, silk yarn, cotton and cotton thread. Franklinville, another village centered around a mill, was born in 1827 with the founding of the Franklinville Cotton Factory. In 1813 a grist, saw and flour mill had been erected in Rockland. In 1831 this mill became a calico printing works, and in the 1850s it was used to spin cotton. Rockland had a tavern, the head miller’s house, a post office and general store, and rowhouses for mill workers and team drivers. In the 1840s the mill village of Elysville was founded. It was here that the Daniels Dam provided power to a denim and canvas mill, and in the 1850s the mill supplied the U.S. Army with tent canvas. The small community of Texas, in northern Baltimore County, developed in the mid-19th century around lime quarrying and burning. At one time there were as many as 40 lime kilns in the area. Other lime kilns were located near Rockland, Wakefield, Greenspring, and the Gunpowder Falls. Many miners’ barracks were constructed in Texas. In the Caves Valley district, iron ore mining began around the middle of the 19th century to supply the Ashland Iron Furnace. In western Baltimore County, commercial granite quarrying began in the 1830s to provide material for the Baltimore & Ohio Railroad. The earliest companies active in this area were the Walters and Fox Rock companies, which both employed over 50 men. The aptly-named village of Granite sprang up around these operations. Residents were of African-American, Scotch, Welsh, English, French and Italian extraction, and the village soon had two churches, a school, a social hall and various community buildings. In the 1840s the Gunpowder Falls became home to the Gunpowder Copper Works. This enterprise included a sheet mill, two annealing furnaces, a till and bolt mill, two furnaces, a blacksmith shop, a carpenter and turning shop, two refining shops, a slag furnace, coal houses, and dwellings for the laborers. Several iron furnaces operated in Baltimore County during the 19th century. The Northampton Furnace continued to operate, employing 50 laborers in 1820. By 1826 it had shrunk to 22 workers. The Gunpowder Iron Works stayed in business until 1866. In the 1840s the Ashland Iron Works was chartered, and by 1850 it employed 45 laborers. The Ashland Iron Works was the first in the county to use anthracite coal rather than charcoal to power its blast furnace. The Civil War did nothing to dampen the success of this operation—in 1860 the company employed 200 people, increasing to 250 in 1865. The village around the furnace included a store, a school, a church and 65 workers’ dwellings. In 1815 the former Dorseys Forge property was bought by the Ellicott family. In 1822 the complex became the Avalon Iron Works near Elkridge and continued to operate throughout most of this period. In 1840 the iron works had thirty hands, but by 1850 it employed 140 people to operate puddling furnaces and nail machines, among other things. A large number of tenements had been built by this time for the company’s employees. In 1868, however, the Patapsco River flooded and washed away many of the buildings associated with this enterprise. In 1817 the Joppa Iron Works was established north of Gunpowder Falls. This business included a rolling and slitting mill, a nail manufactory and a kiln. The complex was destroyed by fire in 1832, but quickly rebuilt. In 1850 the company employed 130 people, but expanded even more the next year. Employees were housed in company-owned tenant houses. possession of the Maryland Historical Society. Between 1851 and 1857 there were usually 30 to 39 employees listed. Most of the names were Irish, but cart drivers were only identified by their first names, indicating that they were probably slaves. The ledgers record one instance when the ore miners refused to work unless their wages were raised to $1 a day; it is not known how this strike turned out. The company’s fortunes waned as the 1850s drew on, and in 1857 the number of employees dropped to 10. The area around Freeland was home to several paper mills beginning in the 1820s. In 1850 the Davis Plow Factory was opened in Davisville. The Keeney Mill operated in the Eklo vicinity, and its owners provided several houses for its workers. A cotton mill was established north of Baltimore City in 1847 and gave rise to the mill town of Phoenix. The Pocahontas and Powhatan factories had dominated Woodlawn since 1810. During the 1820s, the Aetna Powder Works operated on the Gwynns Falls. In 1833 the mill was bought by the Bellona Powder Works. In 1860 the company had only five employees, and together they earned $180 per year. The Mechanics Cotton Factory operated near Hebbville during the 19th century. Another venture that provided employment for industrial laborers early in this period was the construction of the B&O Railroad. Work began in the late 1820s with a labor force of about 800 men, which soon became 2,000. The construction work was dangerous, as is evidenced by the death of four Irish immigrants who were killed when the bank under which they were digging collapsed. During the summer of 1829 the work proceeded in shifts around the clock. Many of the workers were Irish immigrants. They lived in a series of temporary shanties or wooden cabins along the path of the railroad as it was being constructed, and many took their families with them. The period of Agricultural-Industrial Transition saw the true flowering of industry in Baltimore City. During these years industry expanded and diversified, and many of the working-class industrial communities that have left their legacy in the form of the ubiquitous rowhouse were formed. In some ways, Baltimore was like a huge company town run by a number of different companies. The northern part of the city near the Jones Falls boomed with mill villages during the early part of this period. This area was not actually annexed into the city limits until 1888. By 1860 there were several mill villages, including the Mt. Vernon, Clipper, Druidville, Woodberry, Hampden, and Sweetaire villages. Census data shows a total of 536 mill employees in this area in 1860 and 616 in 1870. In Mt. Washington, a textile mill opened in 1835. The owners built about 40 houses for their workers. The business employed a diverse set of skilled and unskilled labor: in addition to the main mill, the complex contained a machine shop, a carpenter shop, a dye house, and a boiler room. Over in West Woodberry, the Woodberry Mill, also a textile factory, constructed housing for its laborers in 1843. This mill changed ownership several time during this period, but it remained a model mill village. A few of the workers lived in single-family houses, but most lived in duplexes. The community also had a store and a church. In the mid-19th century the Mt. Vernon Mills rose to prominence. Built in the style of a Rhode Island-type mill village, the residential area, known as Stone Hill, was placed near the mill for economic efficiency. The company controlled housing, the church and the store. Further west, the Franklin Paper Mill in Dickeyville was bought by the Wethered family in 1829 and converted to the Ashland Textile Mills. During the years between 1829 and 1871, when the Wethered family sold the factory, the town built worker housing, a school, churches and an International Order of Odd Fellows lodge hall. Western Baltimore also grew from increasing industrialization. In the Barre Circle district, the Hayward and Bartlett Iron Works was the first industry. By mid-century there were about 200 rowhouses for blue-collar laborers. Barre Circle was unusual in that instead of having a mixed blue- and white-collar population, it was almost exclusively blue-collar. Nevertheless, class distinctions did manifest themselves in residential patterns: Skilled craftsmen lived on the main streets while semi-skilled workers and free African-Americans lived in cramped tenements on the smaller streets and alleys. The B&O Railroad yard at nearby Mt. Clare Station employed 1,000 workers from the Barre Circle district by 1852. A peaceful strike had occurred there in 1839 when the company attempted to withhold back wages from employees who had been fired for dangerous negligence. The strike was broken, and its leaders were fired. The old iron works had become the Hayward-Bartlett Locomotive Works, and this operation and the Winans Locomotive Works employed 350 people each. By 1867 more housing was needed for the mostly Irish and German railroad workers, so Winans constructed another 100 three-story houses for them. By this time there were also two more furnaces and two wagon factories providing employment in the district. Another working-class community developed in this area as well. The Union Square-Hollins Market district was developed during the 1840s as a residential and commercial area for employees of the B&O Railroad shops, the Winans Locomotive Works, the Hayward-Bartlett Iron Works and the Newman Brothers Piano Works. By 1851 about 1,500 people were employed by these businesses. Many of the residents in this area were German and Irish immigrants who had come to Maryland in the 1830s. In southeastern Baltimore the area known as Canton developed during the second quarter of the 19th century. In 1828 the Canton Company, a real estate developer, began 100 years of planned growth. Canton became “an uninterrupted picture of a working-class neighborhood in the second half of the 19th century,” eventually containing 91 square blocks of rowhouses. The area had begun to develop in the 1820s with shipyards, wharves, and the 1829 Canton Iron Works. By 1850 the district contained three furnaces, a forge, a cotton mill, a saw mill, a distillery, a candle and lard oil factory, a steam planing factory, a ropewalk, two shipyards, and seven brickyards. These industries together employed about 900 men. The population stood around 2,000 people inhabiting just over 100 dwellings, with one school and two churches. Before the end of the period Denmead’s Engine Factory, the Baltimore Copper Smelting Company and several canneries had opened. Many of the copper workers were Welsh immigrants. During the Civil War the Abbott Mills produced rolled iron plates for the Federal government, for which its employees were exempted from the draft. In the Federal Hill area, several hundred houses for blue-collar workers had been erected by the middle of the 19th century. By the 1840s the base of the hill had become packed with oyster-boat docks and shipyards. Federal Hill itself was also the location of several sand-mining ventures. In Fell’s Point, shipping, warehousing and shipbuilding remained important. Towards the end of the period, canning and can manufacturing also became prominent. South of the city, the Westport area continued to grow through the mid-19th century. In Jonestown, the famous Shot Tower was constructed in 1828. Not long after the area became a center of the garment industry, attracting German, Jewish, Irish and Eastern European immigrant laborers. Many sweatshops were opened on Baltimore and Lombard streets. In the Gay Street area of Jonestown, a brush factory, freight company and bakery opened as the area became more commercial and less residential. Between Little Italy and Fell’s Point, the industrial South Central Avenue neighborhood began to develop in the 1820s. Furniture and mattress manufacturing, malting, lumbering, textiles, tanning and iron working were all prominent industries. For the most part, however, this area served as an ancillary production center for other Baltimore industries such as textiles, brewing, canning and construction. Many textile sweatshops were operated in this area. The earliest rowhouses here were constructed between 1828 and 1840. The working-class residents of this area were an ethnically diverse group, including Irish, Italians, Russians, Poles and African-Americans. Camden Yards began its evolution into an industrial/urban residential area during this period. Many of the area’s early residents were artisans or businesspeople, but by the mid-19th century many of its residents were African-American laborers. Around this time a number of Irish and German immigrants also moved into the area. Industry was spurred by the construction of the B&O Railroad’s Camden Station in 1852, providing employment to many of the neighborhood’s residents. Rowhouses that had formerly housed single families were converted to multiple-family dwellings and boarding houses. Other industrial enterprises here included canneries, lumberyards, cooperages and stone yards. Howard County saw a rapid industrial boom during the period of Agricultural-Industrial Transition. In the 1820s industry extended to the southern portion of the county with the construction of the Savage Mill. This mill was primarily a carding and spinning operation, but the Savage Manufacturing Company also ran a warehouse, a flour mill and a saw mill. The owners built brick housing for their workers throughout this period. By 1825 the company had added a grist mill, an iron foundry and a machine shop. It employed 200 people, including women and children. In 1847 the company changed hands, and the iron foundry began to concentrate on making cotton mill machinery. Around this time a dry goods store and a grocery were built for the village, and most of the workers’ houses date from the middle of the century. In Elkridge, the furnace community peaked and then declined. By 1820 the Ellicotts had bought the business and expanded the forge. In the 1830s many of the extant buildings were constructed, including a mansion for the owner, a house for the manager or the clerk, a company store, a workers’ dorm and workers’ duplexes. There are two other small buildings that may have been slave quarters. The furnace’s business slowed, however, and it closed in 1854. The 1868 flood of the Patapsco River destroyed the furnace. The now-abandoned village of Simpsonville reached its peak during this period. In 1850 the village had two mills and a textile factory (which employed six people) and was called Owingsville. By 1860 a wheelwright, a blacksmith and a merchant were located in the village, as well as at least eight residences. The woolen factory employed ten men and seven women. The grist and saw mills only employed one person each. The village mainly served as a commercial center for the surrounding agricultural population, and that is where most of the labor came from during this period. James Sykes built a flour mill in the 1830s in what is now Sykesville (straddling the border of Howard and Carroll counties), anticipating the coming of the B&O Railroad. Sykes also owned several cotton and woolen mills in Frederick and Baltimore counties. He brought trained workers from England specifically to staff his mills, and eventually built the Howard Cotton Factory in Sykesville. At its peak this operation employed 200 people. Sykes built housing and a church for his workers. Economic hardship caused the factory to close in 1857, however. It operated sporadically thereafter until the 1868 flood destroyed most of the town. In the present-day town of Daniels, the Elysville Manufacturing Company was incorporated to produce cotton textiles in 1829. The mill was not actually constructed until 1845 and was not put into operation until 1847. A village quickly grew around the mill, however, and included several stores, a railroad station, a school and mill workers’ houses. In 1853 the business was sold to the Alberton Manufacturing Company and the town’s name was changed to Alberton. Although the Sagonan Manufacturing Company bought the enterprise in the late 1850s, the village retained the name of Alberton into the 1870s. By 1860 the mill had 120 looms and 3,000 spindles, and it employed 50 men and 120 women. Around the mid-19th century, the B&O Railroad began constructing water stations along its tracks to help provide steam power, and it was not unusual for small communities to develop around these supply points. In Howard County, Nathaniel and William Cavey built such a water station near the Gray Manufacturing Company’s cotton mill in 1869. Residents of the small community that grew up here worked at the Gray’s Cotton Mill, the Patapsco Cotton Mill, and the mills in Ilchester and Ellicott City. Another such water station had been built on Williams Run near Ellicott City earlier in this period. In 1825 J.D. 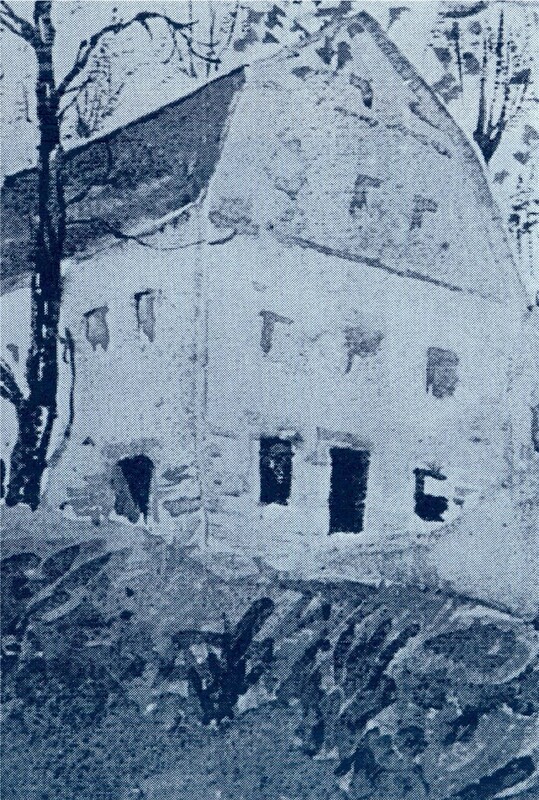 Matthews built a house and store to accompany his grist mill in Roxbury Mills. Just north of Ellicott’s Mills, the community of Oakland Mills developed in the 1820s. A grist mill was the focus of the village, and workers’ housing and shops for skilled artisans associated with the mill, including a cooper, were constructed. The Hockley Forge and Mill was converted to a distillery and malt house from 1829 to 1833. In 1852 it reverted to being a grist mill. Just south of Savage in Prince George’s County, the village of Laurel Factory expanded across the county line into Howard County in the 1840s. Near Fulton on the Montgomery County line, several lime kilns were constructed and operated during this period. The Elba Furnace mined ore and worked iron near Sykesville. The B&O Railroad was constructed through Howard County in the early 1830s. As everywhere else where the tracks were constructed, the laborers lived primarily in temporary shanties. While working on the Thomas Viaduct, wages actually decreased for the German and Irish workmen, causing some unrest but no overt violence. Many of the small saw and grist mills that had been established in Carroll County during the previous period now began to attract small communities. Other industries also began to gain momentum between 1815 and 1870. In particular, railroad construction, tanning and lime production gained importance. Finksburg had been established in 1810 with the construction of a tavern. Real growth did not occur until the coming of the Western Maryland Railroad in the 1860s, however. Shortly after the Civil War the Patapsco Mining Company, a cannery and the Baltimore Roofing and Asbestos Manufacturing Company located there. The Caledonia paper and flour mills also located nearby. Mt. Airy was another community that benefited from the railroad—construction of a tunnel brought between 200 and 300 construction workers to town who ended up staying. The Roop Mill near Westminster, which had originally been constructed in 1795, became a grist, saw and cider mill during this period. On Pipe Creek, the Marker’s Mill complex included brick, saw and clover mills in 1835. A small community had arisen by 1860. The village of Spring Mills on Little Pipe Creek was also centered on a grist and saw mill, but also included a tavern, blacksmith shop and railroad depot. McKinstry’s Mills, near Union Bridge, were built from the 1820s through the 1840s. A cooper and a shoemaker were brought to the village around 1840, and a store was built in 1850. The Oakland Mill, which had been built as a grist mill in 1796, was converted to a cotton mill in 1834 and spawned a company town. In 1848 Isaac Hoffman, a member of the Hoffman milling family of Baltimore County, moved to Carroll County and built paper and fulling mills near Houcksville. Roller, Hood’s Mill, New Windsor and Lineboro were other villages that grew up around mills. Taneytown was home to a clock factory during the first half of the 19th century. In Westminster, the county seat, the Western Railway Company came through town in 1861 and attracted industry along its tracks, spurring the neighborhood nickname “Irish Town” for the Irish immigrant laborers who lived there while constructing the railroad. Similarly, the Western Maryland Railroad’s shops in Union Bridge, built during the Civil War, provided employment for many residents and attracted other industries. The Western Maryland Railroad also built dwellings for its employees. Cigar manufactories were opened in Taneytown and Manchester, hat factories in Westminster and Uniontown, and a nail factory in Union Bridge. The Union Agricultural Works, which included a machine shop, a blacksmith shop and a saw mill, opened in Westminster in 1852. Tanning was a budding industry in Carroll County during this period. Tanneries were established south of Manchester and at the Union Mills. Rising Sun, the site of a crossroads tavern, became the site of a tannery in 1842. In 1856 the tannery became steam-powered. During the mid-19th century, however, the center of the tanning industry came to be in the appropriately-named Tannery. In addition to several large tanneries, the town had a distillery, a school, a church, a train depot and post office, a telegraph office and a general store. Most of the town’s residents worked in the tanneries. As a county with a large agricultural population, Carroll County needed kilns to produce lime. The Fenby Farm Quarry and Kiln, built in 1844 near Westminster, was one of the largest lime kilns in the county. Other lime kilns were located near Tannery and Union Mills. The construction of the B&O Railroad reached Carroll County by 1831. In that year, many of the workers struck for lack of payment. Led by the Irish, they eventually began to destroy the work they had done. The militia was called out to stop the rioters at Sykes’s Mill, arresting 50 workers. Unrest was present within the workers’ ranks as well: The Irish and African-American workers prepared for a two-day battle near New Market in August of 1831. The exact reason for this conflict is unknown, but fortunately the warring parties were dissuaded from action by a local Catholic priest and the appearance of a militia brigade from Frederick. Old industries expanded and new industries arose in Frederick County during the period of Agricultural-Industrial Transition. The arrival of the B&O Railroad both provided industrial labor and spurred the growth of other industries dependant on access to transportation. The railroad era gave rise to a few small settlements throughout the county and also benefited a few mill villages. Buckeystown Station was established in 1831 and was home to railroad workers. Adamstown was founded around 1835, also by railroad workers. Doubs, the location of Charles Carroll of Carrollton’s mill, grew after the arrival of the B&O Railroad. During the 1850s the community known as Slabtown developed a lime burning industry thanks to the railroad. In 1858 the Grove Lime Company located itself there and built housing for its workers. Point of Rocks was established as a B&O Railroad station in 1831, and the construction of the C&O Canal was taking place nearby. The proximity of both of these projects led to the construction of housing for the workers, and a town was laid out in 1835. Many of the workers were Irish, so a Catholic Church was built in town. Knoxville was established primarily to serve railroad and canal workers around 1830, and also served as a shipping point for Burkittsville area farmers and distillers. The town had a hotel and several churches by 1870. A railroad water station was constructed in 1831 near what became the village of Monrovia. By the 1850s a small community had developed and a bark mill was in operation. Several of the larger mills that had been established during the previous period shifted from custom to merchant milling around the middle of the 19th century, although many still performed custom work for local farmers. Some of these mills were Kinna’s Mill and Black’s Mill. The Benjamin Rice Mill added cooper and blacksmith shops during the 1850s, and the Bowlus Mill added blacksmith and wagons shops. A merchant grist mill was built in Utica in 1815, and soon attracted a community that included a church, a general store, a school and a cooper shop. The proprietor of Catoctin Furnace built a combination saw and grist mill in 1824, and the village of Lewistown developed around it. Industry remained in the Sugarloaf Mountain district for most of this period, but fizzled out towards the end. The Fleecy Dale Woolen Factory closed in 1860, with only nine employees at the end. Michael’s Mill in Buckeystown was quite prosperous during this period. By 1842 the complex included a saw mill, a grist mill, a stable, a cooper shop and two warehouses. There were also four dwellings and slave quarters for those who worked at the mill. Two fires almost destroyed the complex in 1855 and 1858. Both were supposedly set by a female slave acting on a grudge against her owner. Several new mill villages developed between 1815 and 1870. Slate quarries had been developed near the future town of Ijamsville during the early 1800s, but a village didn’t develop until 1831, spurred by the construction of both the Ijams Mill and the B&O Railroad. In Harmony Grove, near Frederick, Worman’s Mill was built around 1840. A small community of mill owners, employees and skilled craftsmen soon sprang up. In Licksville, the Greenfield Mills were constructed in the 1830s. The Glade Valley Mill was constructed around mid-century and spawned Troutville. A woolen mill was built on the Little Catoctin Creek in the 1840s, around which grew the community of Beallsville (now Harmony). For such a small community, Beallsville was religiously diverse: it had three churches. A copper mine opened near New London in 1840 provided the impetus for the development of that town, which had already been home to a couple of mills. Not much is known about the labor that ran these industries, but there are some indications that both the mills and the mine were dependant on slave and indentured labor, and that after the Civil War many of the former slaves continued to work there. Catoctin Furnace continued to be an important industrial force between 1815 and 1870. Despite its isolation, manor houses had been built for the owners and the iron master by the early 19th century. The operation reached its peak from the 1850s through the 1880s, adding two furnace stacks during this time. Labor continued to be supplied primarily by slaves up through the Civil War. During its peak years, the furnace employed over 300 wood choppers and coal makers, 100 miners, and 100 men at the furnace, which was kept in blast 24 hours a day. The importance of tanning in Frederick County rose during this period. The Michael Wiener Tannery was built in Burkittsville between 1834 and 1840. This complex included a pottery kiln, shed and holding pens, wheelwright, blacksmith and carpenter shops, a loom house, tanning vats, and a manufacturing building. A distillery was also opened in the town. Another tannery was opened in Hansonville around 1840, and the Birely Tannery complex in Frederick became an important industry in that town. Lime production was another industry that rose to prominence in Frederick County during the period of Agricultural-Industrial Transition. The Hoke/Grove Lime Kiln operation was built in Frederick in the mid-1800s by a German immigrant. It eventually became one of the largest and most important lime kiln businesses in the state and was bought by one of the largest limestone quarrying companies in the country. The site retains five residential buildings, outbuildings and possible remains of the kilns. Defunct charcoal hearths dot the landscape in the City of Frederick Municipal Forest, testifying to the pervasiveness of the lime industry around Frederick during the 19th century. The Burkittsville area was another center of lime production in the county. Unlike many other Piedmont counties, Montgomery did not experience an explosion of industrial activity during the period of Agricultural-Industrial Transition. Industry remained characterized by milling and quarrying. Construction on the C&O Canal had begun, and from 1833 to 1834 it was completed from Point of Rocks, Montgomery County to Harpers Ferry, West Virginia. Triadelphia was one of the few industrial communities in Montgomery County that bloomed during this period. It was home to a cotton mill, a blacksmith shop, a grist mill, a saw mill and a granary. Before the Civil War most of the grain grown in the lower part of the county was milled here. In 1868, however, much of the village was swept away in a flood. The Dufief Mill reached its zenith around the mid-19th century. The owner of the mill also owned 19 slaves, and the mill property included a flour mill, a saw mill, a miller’s house, a warehouse and a barrel house. In 1870 the mill employed just three white farm laborers and one African-American domestic servant. A mill was constructed in 1840 in what came to be known as Greenwood Mills, and in 1865 a cottage was built for the miller—an ex-slave who had spent most of his adult life milling. In Clarksburg, a tannery was established during the 1820s and the town subsequently became a center of commerce in the northern part of the county. In Hyattstown, the grist and saw mill performed both custom and merchant milling. Nearby a quarry was opened to produce roofing slate. The quarries near Seneca saw increased use from the 1830s through the 1840s. During the former decade a stone mill was built to cut stone for construction of the C&O Canal, and by the 1850s the community also had a grist mill. In the 1840s Seneca sandstone was quarried for use in the construction of the Smithsonian Institution. In 1863 a school was built for the children of the quarrymen. The Seneca area was also home to one of the few mills for which anything is known about the labor used to run it: The 1850 census lists seven people working for the Long Draught Mill who cost the business $125 in wages every month. Other quarries were opened near Cabin John in the 1830s. Near Wheaton, the Gilmore Mica Mine was likely opened sometime during this period, although the exact date of its inception is not known. It was during the late 1820s that construction began on both the C&O Canal and the B&O Railroad. The C&O Canal was begun in Washington, D.C., and thus was completed through Montgomery County earlier than the B&O Railroad, which was begun in Baltimore. Nevertheless, both projects involved thousands of laborers (many of whom were immigrants) who spent years on the job, living in temporary camp after temporary camp. While one might expect these projects to have left a noticeable impact on the landscape, little remains except for the actual canal and railroad themselves. The town of Dickerson, however, was established late during the period of Agricultural-Industrial Transition specifically to serve construction gangs working on the Metropolitan Branch of the B&O Railroad. The company responsible for the construction of the C&O Canal experienced labor troubles from the very beginning. First, a plan to import indentured servants for the work failed, and then a plan to purchase enslaved African-Americans fell through. Eventually the labor force consisted of a mix of Irish immigrants and American artisans. Drinking caused many problems among the workers, and when the company tried to prohibit it the problem only grew worse. The Irish were split into two rival factions, the Corkonians and the Longfords, who were often threatening each other with violence. A cholera epidemic struck the laborers working on the construction of the canal in 1832, and again in 1833. The cemetery of St. Mary’s Church in Barnesville supposedly holds a mass grave of laborers who fell victim to this disease. As always, milling played an important part in the industry of Harford County. Monkton Mills, which was still centered around a large grist mill, reached its peak during the late 19th century. Both the Mill Green and Lower Deer Creek Valley districts continued to prosper, though no major developments occurred. Much of the Stafford milling complex was washed away in a flood in 1904, but the flint and bone mill continued to operate until 1920. Soapstone quarries and a soapstone mill were opened in Stafford around 1880 and also continued to operate until 1920. The Reckord Mill, a merchant flour mill, was opened in Bel Air, the county seat, in 1886 and remained the only industry in the town until the 1950s. Many milling enterprises in the county also met their demise during this period, however. The Jerusalem mill village, once one of the most important in the county, slowly died out and was only a shadow of its former self by the dawn of the 20th century. The Whitaker Mill has been described as being a thriving industrial center in 1890, but was closed by 1900. The Husband Flint Mill was rebuilt in 1909 but only lasted another ten years or so. 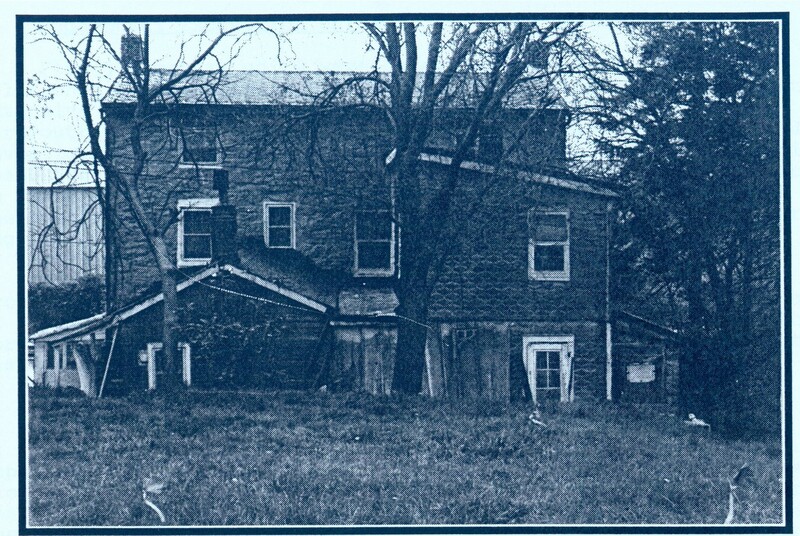 The Eden Mill near Pylesville, owned by a gristmill magnate, burned in 1906. During the first quarter of the 20th century, however, it continued to operate as a power plant for Fawn Grove, Pennsylvania. The Chrome Valley Mill was closed down in the 1920s. During the last quarter of the 19th century the slate quarrying industry in the northern part of the county became prosperous. The sister villages of Cardiff and Whiteford, both in Harford County, and Delta, Pennsylvania all developed around four quarries in Maryland. Many of the miners who lived in these villages, especially Cardiff, were Welsh immigrants who had been miners before they came to North America. Synthetic roofing became popular in the early 20th century, but the miners were able to keep their livelihood by shifting to the mining of green marble. A related industry was the quarrying of talc begun near Dublin by the Harford Talc Company in the 1920s. The most important industry in Harford County from 1870 to 1930, however, was canning. Harford County was the state’s leader in this business, which was the third most important in the state between 1880 and World War I and employed more workers than any other industry in Maryland by the 1880s. The southern part of the county near the Chesapeake Bay, especially the Perryman area, was the center of canning within Harford County. About a half dozen canning communities developed in the county, of which Perryman remains the most intact. In fact, canning did not come to Perryman until 1917. Previously canning had been centered along the coast in an area that was condemned by the U.S. Army for proving grounds. When this happened, the Mitchell Company relocated to Perryman. The Mitchells built many houses for their workers. 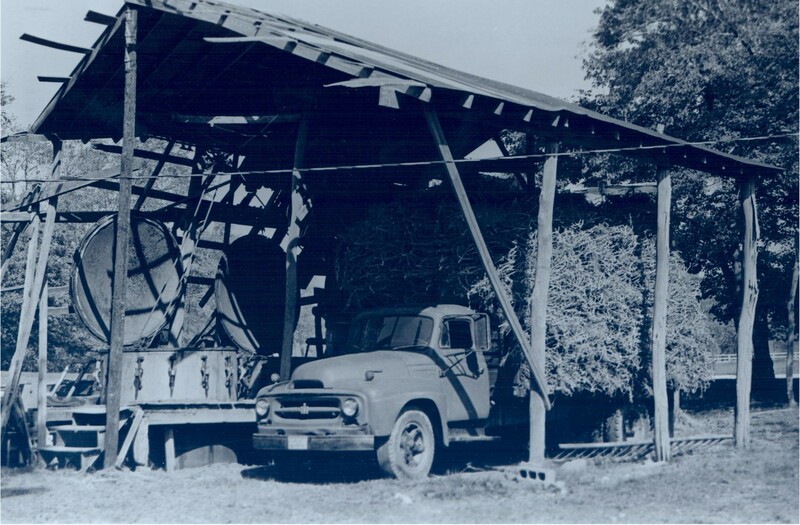 The agriculture of Harford County had diversified by this time, and corn, tomatoes and fruit were the most popular items to be canned. Canning also came to the towns of Aberdeen, Darlington and Havre de Grace during the late 19th century. In Havre de Grace the Seneca Company opened a fruit packing and can manufacturing plant in 1878. By 1899 the company had begun canned goods brokering as well. During the Spanish-American War the government bought Red Cross-brand canned goods from this business. In Bel Air, a railroad connection in 1883 led to the construction of warehouses for the canning industry, although no canning operations were actually located in the town. The warehouses, however, gave rise to the Maulsby district of Bel Air. A row of 13 tenant houses still exists there. The laborers who lived in the Maulsby district were mostly Anglo-American. As if Baltimore County had not become industrialized enough during the previous period, a few more enterprises managed to squeeze their way into the county between 1870 and 1930. In the village of Corbett a saw mill was built in 1885, accompanied by a coal yard. The saw mill was ill-fated, however. Newspaper accounts tell of various accidents at the mill, and it closed down in 1900. The Feeney and Atherton quarries joined the Walters and Fox Rock quarries in Granite, but all four went out of business by the 1930s. The sole purpose of the EFC was to take over the job of building company housing for selected companies. In 1918 the EFC constructed over 500 houses and stores in Dundalk and almost 300 houses and a mess hall for bachelors in the adjacent community of St. Helena. Like Belcamp in Harford County, Dundalk and St. Helena were built using the Garden City as a model. After the end of the war, the EFC sold the houses it had built back to the Dundalk Company to finish the job. During this time the community was surrounded by fences and barbed wire. During the 1920s the development of Dundalk was patterned after the neighborhood of Roland Park in Baltimore, a pioneering “model suburb.” In 1920 the houses, which had previously been rented, were put up for sale. Residents got the first chance to buy them, and the barbed wire fencing was taken down. Dundalk is historically significant for two reasons. The first is that Dundalk and St. Helena were the only two EFC projects in Maryland and were two of only 36 nation-wide. The second reason is that the EFC marked the federal government’s first real entrance into the field of public housing. The Dundalk Historic District, which extends over the line between Baltimore County and Baltimore City, was listed on the National Register of Historic Places in 1983. Many of the old manufacturing centers remained vital during this period as well. The Franklinville Cotton Factory burned in 1881, but was rebuilt in 1883 and added a boiler house in 1895. In 1899 the company, including the entire village of Franklinville, was sold to a large cotton duck conglomerate, the Mt. Vernon Woodberry Company, for $50,000. Mt. Vernon Woodberry did its best to transform Franklinville into a true mill town, building a Presbyterian Church, a dance hall, a general store, and workers’ duplexes clustered around the mill. The cotton factory fell on hard times, however, and was closed in 1903. In Oella, the Union Manufacturing Company reformed and bought out the Granite Hill Factory. Union built many new buildings, including frame houses for the workers, but soon fell into financial ruin. In 1887 the factory was bought by the W. J. Dickey Company and expanded into the largest woolen mill in the south. A fire destroyed the mill and threatened 600 workers’ homes in 1918, but the mill was rebuilt and the company achieved success prosperity again. The Thistle Manufacturing Company changed hands and functions a number of time during the early 20th century. While it had previously made cotton thread and silk products, in 1919 Edward and A.A. Blakeney and Company bought the factory and converted it into a cotton duck manufactory. It was soon sold again, however, and began producing fabric for automobile tires. In 1922 the Bartgis Brothers Company bought the complex and began producing paperboard. The Avalon complex was converted into a water works in 1910 by Victor Bloede. He also directed the construction of Bloede’s Dam, one of the world’s first submerged electrical generating plants. The Patapsco Mill, on the site of the former Ellicott’s Mills, continued to operate throughout this period. In 1877 the Rockland Mill converted back to flour milling from cotton spinning, and it remained a flour mill until 1922. The Gunpowder Copper Works employed 30 people in 1877, but could not last through the end of the century. In the early 20th century the former Grays Mill sites were taken over first by the Patapsco Electric and Manufacturing Company, and then by Baltimore Gas and Electric (BGE). The Oregon Iron Works went out of business in the 1880s, at which time the Ashland Iron Works began mining Oregon’s ore pits. Nevertheless, Ashland also went out of business by 1890. The Daniels Dam began to provide surplus energy for BGE, and the mill continued to thrive. Finally, the Joppa Iron Works was converted to a distillery in 1913 by the Loreley Distillery Company. Much of the industry that has shaped present-day Baltimore City blossomed during the period of Industrial/Urban Dominance. The importance of the mill villages slowly declined as canning, garment manufacturing, shipbuilding and steel production grew. The Mt. Washington Mill survived through the period, but closed in 1923. In Dickeyville, William J. Dickey acquired the Ashland Mills and constructed a large number of houses and a social hall for his workers in 1871. In 1909 the business was sold to the Glasgow Mills, after which it declined. Dickeyville was formally annexed by the city in 1918. In West Woodberry the Meadow Mill was opened in 1877 by the Woodberry Manufacturing Company. The company continued to operate on the Rhode Island model, employing as much of each family as was lawful. Employees were offered homes at what was claimed to be nominal rent in the neighborhood that came to be known as BrickHill. The company also sponsored a savings association, a church, stores, newspapers and other community businesses. In the Jones Falls Valley the several mills there saw a rise in employment from just over 600 in 1870 to almost 4,000 by 1890. World War I caused a boom in the textile industry, leading to an even larger workforce. The Mt. Vernon-Woodberry Company was the largest employer by this time. Despite company attempts to satisfy workers by building community halls, organizing social events and providing other modern perks, unionism could not be held at bay. In 1916 over 1,000 employees of the Mt. Vernon-Woodberry Company were members of the Textile Workers Union Number 977. In 1923 the company announced that it would institute a longer work week while giving only a minimal pay raise. The union struck for fewer hours and more money. Eventually the company broke the strike, but afterwards the textile industry declined and the company never regained its former success. The area around Camden Station was one of the primary growth areas in Baltimore during the late 19th century. Commercial and industrial concerns gradually replaced domestic buildings as railroad yards and warehouses were built. What residential areas remained were inhabited by an increasing number of African-Americans (the population fed by freed slaves moving north) and Eastern and Southern European immigrants. By the early 20th century, however, the area’s residential population was in decline. Many who were left were unskilled African-American laborers who could not afford to move. One of the most violent labor strikes in Maryland’s history occurred at Camden Station in July of 1877. Financial instability had caused the price of B&O Railroad stock to drop dramatically, and consequently the company’s owners attempted to institute a 10 percent wage cut for the laborers. During the ensuing strike, which began on July 16th, the workers vowed to seize the trains and work yards and even scare off the scab workers the company was intending to bring in. While this strike did not last long, it was revived four days later when the workers heard that Maryland’s governor was calling the militia out to prevent a similar strike situation in Cumberland. About 15,000 people reacted to this order by rioting around the station, tearing up tracks, toppling passenger cars and setting fires in order to prevent the militia from leaving Baltimore. The soldiers responded by firing into the crowd. After all was said and done, the B&O Railroad had witnessed one of the bloodiest strikes in its history. The area around Patterson Park and Highlandtown was developed after the Civil War. Germans were some of the first immigrants to settle there, but before the period was over they were joined by Irish, Italians, Bohemians, Finns, Ukranians, Poles, Russians and Greeks. Many of these immigrants worked in the area’s breweries, meat-packing companies and tanneries, but some also worked further away from home for the Pennsylvania and B&O railroads, the American Can Company in Canton, in the shipyards and steel mills of Sparrow’s Point and Dundalk, and for the Crown Cork and Seal Company, Esskay (the hot dog manufacturer) and a stove manufactory. Unlike many working-class areas in Baltimore, many residents of the Patterson Park-Highlandtown area owned their own homes. This was made possible by the fact that no single company controlled the entire area, and signals an attempt to achieve what was perceived as middle-class American respectability by the residents. Crown Cork and Seal Company and Noxema both located in the North Central District during the late 19th century. This area had a mix of upper-class and blue-collar residents, many of whom worked for Crown and Noxema. The working-class residents were primarily African-American. Fell’s Point continued to be a center of the shipping trades, but no other industries were introduced. Further south, a glass factory and eleven related dwellings were constructed in Westport in 1882. During the early 20th century a number of industries, such as the Westport Paving Brick Company, were established. In 1918 the area was formally annexed by the city. In Jonestown the clothing industry continued to grow and to open sweatshops. In 1900 Baltimore was the fourth-largest clothing-manufacturing city in the country, employing over 10,000 workers (over half of whom were women). Several unions attempted to fight the exploitation of the sweatshops, including the United Garment Workers, the Knights of Labor and the Amalgamated Clothing Workers (founded in 1914). Ethnic, gender and occupational divisions hindered a unified labor movement, however, and several unions often fought each other. Small strikes against poor wages and deplorable working conditions were common. Major strikes occurred in 1892 and 1913. The former led to legislative reforms concerning working conditions, while the latter led to an agreement between workers and the Greif Company that represented little improvement for the workers. Sweatshop conditions had largely been eradicated by the 1920s, but the influence of the unions had also declined by the time of the Great Depression. This brought about the return of sweatshops and ever-lower wages. A strike in 1932 succeeded in re-establishing the Amalgamated Clothing Workers in Baltimore, as well as prompting another public outcry against unhealthy working conditions. In addition to garment factories, machine shops, creameries and a box factory also provided employment for residents of Jonestown. During the late 19th century Italian and Jewish immigrants moved into the area, giving it the nickname Little Italy. The nearby South Central Avenue continued to grow as a sweatshop center for the garment industry as well. In the Gay Street area of Jonestown, commercial and light industrial enterprises continued to push residents out. By 1902 the neighborhood had virtually no residents. In Canton, rail connections facilitated the area’s annexation to Baltimore in the 1870s. Many of the laborers were Welsh, German, Irish and Polish. After the Civil War Canton became the center of the canning and oyster and fruit packing industries in Baltimore. The area was also home to machine shops, car works, gas works, chemical works, and sugar and oil refineries. Construction of residential areas continued until the early 20th century. In Locust Point, to the south, the Chesapeake Pottery Company opened in 1880 to produce majolica, a fad in American ceramic production at that time. The company went out of business in 1914. The Barre Circle area flourished through the 19th century, but in the early 20th century the decline of railroad transportation triggered the decline of industry in the neighborhood. Similarly, the Union Square-Hollins Market area suffered a slow decline throughout the 20th century. The period of Industrial/Urban Dominance saw the beginning of the decline of industry and the rise of suburbanism in Howard County. Nevertheless, what industry did survive remained focused on textile production. Lumbering and canning also made their debuts. Other small industries, such as quarrying and telegraph equipment production, failed to make much of an impact. Some mills continued to grow between 1870 and 1930. In Daniels, the Sagonan Manufacturing Company mill went from 120 looms and 3,000 spindles in 1860 to 340 looms and 14,000 spindles by 1895. World War I sparked the addition of a weaving room at the Savage Mill, and the company also built a new community hall and additional tenant houses. The Oakland Mills flourished during the late 19th century, but couldn’t stay in business long into the 1900s. Several small saw mills were established throughout the county, especially in the vicinity of Clarksville. Simsponville’s reliance on mills and its woolen factory declined. During the decade from 1870 to 1880, many of the village’s residents became employed in service occupations such as commerce, medicine, and religion. Many of the members of the working class were farm laborers. Irish and German immigrants accounted for an increasing percentage of the population. The woolen factory was shut down before the turn of the century, and the area remained largely agricultural. In 1881 the Mentzel Paper Factory of Ellicott City began to produce paper from cotton rags provided by the Union Manufacturing Company of Oella in an attempt to diversify the industrial base of the Patapsco Valley. A new factory was built by the Mentzel Company in 1892, but fires in 1895 and 1896 destroyed the complex. The Burgess Grist Mill and Wagon Works was also established in Ellicott City during the 1870s. The Patapsco Cotton Mill near Gray’s Water Station closed in 1888, but the community around the water station survived. Near Elkridge the old site of the Hockley Forge was bought by the Viaduct Manufacturing Company. From 1876 until 1914 Viaduct produced telegraph equipment here. The old Sykes Mill in Sykesville began to be used for a lumber operation in 1906. In 1917 it was sold to B.F. Shriver, a canning magnate who owned canneries and farms in both Maryland and Pennsylvania. North of Savage, the village of Guilford became an industrial center during this period. It had been established during the mid-18th century around a small grist and saw milling complex. Throughout the period of Agricultural-Industrial Transition the mills had remained small, employing one person each. During the period of Industrial/Urban Dominance, however, the mills converted to textile production. Early in the 20th century a granite quarry was opened there as well. Industry blossomed in Carroll County between 1870 and 1930, spurred on by the construction of a number of railroads. 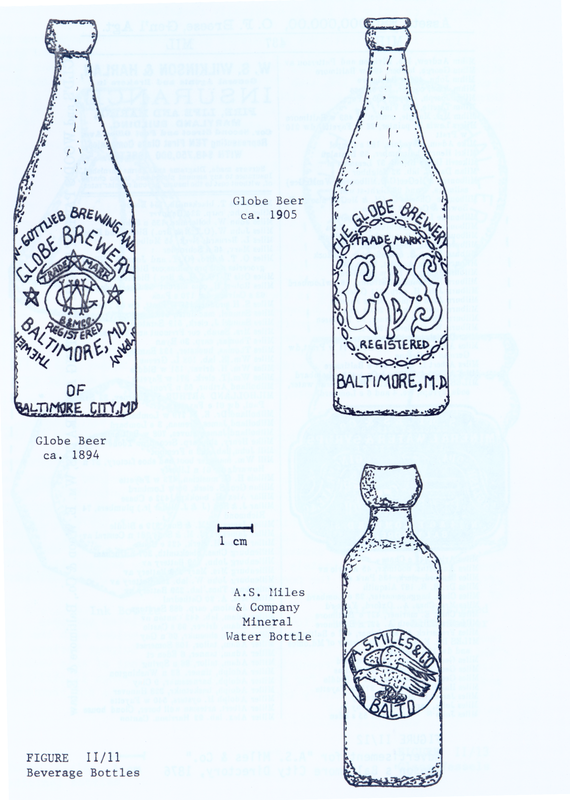 This allowed millers to ship their products to Baltimore more easily and cost-efficiently, and also encouraged the establishment of small-time manufacturing concerns such as cigar and ice cream factories. During this period Finksburg continued to be an important industrial center with an active woolery district. Mt. Airy became the home of the Peoples Lumber and Supply Company, which was destroyed by fire in 1926, and the Mt. Airy Canning Company, incorporated in 1916. Detour, which had been a small crossroads community centered around a grist mill since the late 18th century, was finally laid out in 1868 in advance of the coming of the Western Maryland Railroad. Detour flourished during the late 19th and early 20th centuries as a small mill town and commercial center. Lineboro expanded rapidly during the early years of the period of Industrial/Urban Dominance. Previously a small grist mill village, by 1886 the town had a shoemaker, a cigar manufactory, two blacksmiths, grist and saw mills, a warehouse, a railroad, a post office, a church and two stores to go along with its whopping eight houses. A school was not built until 1905. In 1907 a cannery was built, and in 1918 a lumberyard was opened. During the 1860s the iron industry had begun to become a major force in the Manchester district of northern Carroll County, with mining operations near Ebbvale in Bachman’s Valley. Melrose was laid out in 1872, the same year that the Bachman’s Valley Railroad was constructed. Melrose’s sole purpose was to be the commercial center for the local iron and agricultural industries. In 1874 a cigar manufactory was built and in 1877 a lumber and coal yard was opened. When the iron industry fell upon difficult times in the 1870s, many laborers found work in the lumberyard. Iron ore mining continued until World War I, however, when a miner was killed in an accident. The widow’s compensation claim wiped out the company financially, and the mines were closed for good in 1922. The importance of milling began to wane in Carroll County between 1870 and 1930. Roop’s Mill near Westminster, a grist, saw and cider mill, closed in 1910. Marker’s Mill, in the vicinity of Taneytown, had converted from brick, saw and clover milling to flour milling in 1880, employing three people. The area known as Spring Garden in Hampstead bucked the downward trend in milling and became a commercial center with the arrival of a railroad in 1879. The Hampstead Mill, which had been constructed in 1869, experienced a business boom and remained in operation throughout the rest of the period. In 1921 a lighting factory was added. The community of Hood’s Mill also prospered during the late 19th century, with a store, railroad station, post office and school by 1877. In Oakland the cotton factory became the Melville Woolen Company in 1873 and began to manufacture woolen goods and carpet. By 1910 the town had a several large and small mills, a warehouse, a store and over 60 tenant houses. In Bruceville a fertilizer factory was built. New Windsor was another town that came into its own during the period of Industrial/Urban Dominance. A gristmill had been in operation there from 1808 to 1862, but during the late 19th century a fertilizer factory, a machine shop and an ice cream factory were built. By the 1920s the town also hosted a cannery, a creamery, a fruit packing company, and a flour mill. Several crossroads communities became home to diverse small industries during this period as well. Millers grew from the construction of the Western Maryland Railroad in 1879 and 1880. A cigar factory was operated there in the 1880s and 1890s. Alesia had been the site of a grist and saw mill since 1862, but it really developed only with the coming of the Baltimore and Hanover Railroad in 1879. An applejack distillery was built in 1877, and a lime kiln operated near the village until the early 20th century. The railroad workers instituted a local chapter of the Junior Order of United American Mechanics union around 1900. Taneytown continued to be a prosperous industrial center. In 1894 the town had a coal and lumber yard, three cigar factories, and a steam-powered flour mill. Linwood was a small agricultural village that became the locus of industry for the surrounding farmers. In the 1880s and 1890s the village had an ice cream factory, a railroad station, warehouses, a grain elevator and elevator house, and a freight building. In the 1920s a canning factory was established. Union Bridge was yet another town whose growth can be traced to the influence of the Western Maryland Railroad. During the late 19th century, the railroad shops brought many laborers to town and were subsequently responsible for the construction of employee dwellings. In 1912 the Tidewater Portland Cement Company came to Union Bridge, eventually taking over the town to such an extent that a school, the Maryland Collegiate Institute, left. Westminster reached its industrial peak during this period, thanks in part to the Western Maryland Railway Company. The Fenby Farm Quarry and Kiln continued to operate into the 20th century, but closed in 1907. A tannery was also operated in town sometime during the late 19th century. In the early 20th century a carriage manufactory and machine shop was bought by William F. Myers, who used the plant to pack pork and produce cider and apple butter. Lumberyards began to prosper in the 1870s, and a gas light company was opened during this decade. A cigar manufactory was opened in 1869, and the Shriver Canning Factory of Union Mills opened a plant in town in the early 1870s. A second Shriver plant was opened later in that decade. The Shriver business canned a number of items, including fruit, vegetables, pies and applesauce. In the early 20th century the company moved its operations to a spot just outside the city limits. The main working-class neighborhood in Westminster was along Main Street, and East Main Street today provides one of the few remaining examples of such neighborhoods in town. This part of town is not looked upon highly, however, and the historic sites surveyor who recorded part of this area made a telling comment in the Maryland Inventory of Historic Properties documentation: “The homes have apparently always attracted a rather raffish clientele (even today they rent by the week and generally to laborers and unskilled workers, much to the consternation of their neighbors).” With attitudes like this, one wonders how any such neighborhoods have survived and why such apparently biased surveyors have bothered to record them. Many of Frederick County’s industrial towns and villages reached their zenith during this period before fading away during the Modern period. Tanning, iron production and milling all lost their prominence, but canning, lime production and various divers industries blossomed. Buckeystown was a bustling industrial center from 1870 to 1910. Business in the town included a tannery, a cannery, a creamery, an icehouse, a blacksmith, a brickyard and several mills. Brick manufacturing and corn canning were especially important, and there are still some workers’ houses for these industries there today. Many of the laborers who worked in the brickyard and the cannery lived in a small African-American settlement adjacent to the town. Thurmont was another town that experienced industrial growth during the late 19th century. The Western Maryland Railroad built tracks through town in 1872, spurring the development of a pottery, a cannery, a weaving factory and a cigar manufactory. Despite all of this business, the town’s population had shrunk to 100 by 1910. Berlin, the location of an early flour mill, experienced its first period of industrial growth at the end of the 19th century. In 1890 the B&O Railroad located a rail yard there, causing a boom in economic activity that continued until 1930. The town’s name was changed to Brunswick, and many rowhouses for the rail yard workers were built along the tracks. Many of the existing rowhouses date between 1906 and 1941. The rail yard is still operating in Brunswick. In Monrovia, the late-18th-century Nicodemus Mill was still standing in 1890. During the late 19th century a creamery was built in town, and in the early 20th century the Westport Paving Brick Company opened a plant. In the 1920s several cannery buildings were constructed on the Nicodemus Mill property. Near Johnsville, Buckey’s Mill became the first electrical power house for the Union Bridge in 1908. The long-lived Catoctin Furnace managed to hang on until the early 20th century, long after many such enterprises elsewhere in the state had faded away. There were over 50 tenant cottages in the village in the 1870s. The furnace’s most prosperous period ended in the early 1880s, however, and it experienced a slow decline until finally closing down in 1904. Sugarloaf Mountain continued to be a locus of industrial activity, although of a different type than before. The Fleecy Dale Woolen Factory in Park Mills had gone out of business in 1860, and industry remained dormant until the end of the century with the exception of the construction of the B&O Railroad through the area in the 1870s. In 1898, however, quarries were opened in Dickerson and surrounding areas. African-Americans were the primary labor force in the quarries, and a school was built for their children in Stronghold in the early 20th century. It was during this period that Frederick, the county’s seat and largest city, finally burst onto the industrial scene. Most of Frederick’s industry was concentrated on the east side of town. The first true industrial enterprise in town was the Louis McMurray Canning Factory, which opened in 1869. This was the first of many Frederick industries to take advantage of the surrounding agricultural area. In 1884 the Ox Fibre Brush Company incorporated, and in 1892 it moved to a new location to build a factory, a sawmill and a stock warehouse. In 1890 the Frederick Iron and Steel Company began operation, and in 1889 the Union Manufacturing Company had begun to produce hosiery at the Union Knitting Mills. The Union Manufacturing Company employed primarily women: 238 of 250 employees in 1892 were female. In 1910 the Union Knitting Mills employed over 300 workers. Other industries that started up in Frederick between the 1870s and 1920s were the Frederick Steam Brick Works, the Economy Silo and Tank Company, the Moxie Tool and Die Company, and the White Cross Milk Plant. The Everedy Company built a bottling plant in Frederick in 1922 and also manufactured kitchen utensils. Throughout this period, however, the Ox Fibre Brush Company continued to be a primary employer, with over 300 workers in 1910. It was also one of the earliest industries to provide its employees with a welfare and insurance program, in 1917. Many of the city’s blue-collar workers lived in duplexes on Dill Avenue and on Wisner Street and East Patrick Street in the southeastern sector of the city. Lime production for agricultural use continued to be an important industry in Frederick County. A large lime kiln was operated in Buckeystown Station between 1890 and about 1930. In Lime Kiln, formerly known as Slabtown, the Grove Lime Company continued to be a major employer until the local lime deposits were depleted in 1912. In New London, the copper mine remained an important factor in the town’s growth through 1917. It was replaced as the major industry in town in 1915, however, by the Burrall Lime Plant, which was rented to a local farmers’ cooperative association for the production of lime. The Hoke/Grove Lime Kiln in Frederick continued to be a successful business throughout this period. Near Woodsboro, the Barrick Lime Works Company began quarrying limestone in 1868. The company absorbed many workers from the closing of Catoctin Furnace in 1904, and almost 30 houses were built for these workers between 1890 and 1910. The son of the owner of the Barrick Lime Works founded the Fountain Rock Company in Walkersville in 1870, excavating a quarry, constructing a six-oven lime kiln and building several houses for his laborers. Walkersville was also the site of other industries. In 1872 the town was linked to Frederick via railroad, and by the early 20th century it had a cannery, an ice factory, a clothing factory and a bakery. LeGore, one of the few true company towns in Frederick County, was established in 1890 near Woodsboro. The community consisted of a store and post office, the railroad depot master’s residence, the LeGore Company office and at least five groups of workers’ housing (about 40 homes overall) built during the 1890s by the quarrying company. Laborers from both the LeGore and Barrick companies sent their children to school in nearby Oak Hill. Quarrying by the LeGore Company had largely ended by 1930. Many of Frederick County’s mills and other small industries met their demise during the period of Industrial/Urban Dominance. Kinna’s Mill had reverted to performing custom work in the 1870s, but could not last until the end the end of the century. Black’s Mill went out of business in 1885. The Bowlus Mill in Spoolsville operated until around 1920. In Hansonville, the tannery was demolished around 1900. The Utica Mill, its associated cooper shop and the town’s early school were all razed in the early 20th century. In 1890 Beallsville’s name was changed to Harmony, but the woolen factory there experienced unharmonious times and finally closed around 1900. The Greenfield Mills in Licksville closed around 1890. In Ijamsville, the Ijams Mill, the B&O Railroad and the local slate quarries peaked in the 1890s. The mill burned in 1894, however, and all three industries had left town by the late 1920s. The Glade Valley Mill in Troutville burned in the late 19th century and subsequently moved to Woodsboro, leaving Troutville in decline. It did become one of Woodsboro’s most important industries in the early 20th century, however. Woodsboro was also home to the Rosebud Perfume Company (beginning in 1895) and the Woodsboro Canning Company (beginning in 1909). The Spring Plains Mill in Woodsboro was also a successful business for most of the period of Industrial/Urban Dominance, operating at various times as a flour, a clover and a chopping mill. It closed in the early 20th century. While the period of Industrial/Urban Dominance might have been an ideal time for industry to take root in Montgomery County, it was forced to take a back seat to the growing suburbanization caused by the increasing size of the federal government in Washington. Nevertheless, a few new industries did appear. An iron foundry was added to the Greenwood Mills in the 1870s, and by the early 20th century the grist mill had moved from custom to merchant milling. However, it went out of business and was razed in the 1920s. In Clarksburg, a distillery was established during the late 19th century. The Brookeville Woolen Mill continued to operate during this period, and the company was constructing dwellings for its workers as late as 1900. Sligo Creek in Takoma Park was the site of one of the earliest municipal water works and pumping stations in the metropolitan Washington area of Montgomery County from 1900 to 1930. Several towns benefited from the B&O Railroad during this period. Dickerson continued to serve B&O laborers, and in 1898 stone quarries were opened nearby. Gaithersburg had been established around a tavern decades earlier, but it truly began to grow with the coming of the railroad after the Civil War. This new access to transportation allowed a number of large milling concerns to arise during the 1880s and 1890s. In 1917 the Thomas and Company Cannery, the first and largest vegetable cannery in the county, was opened in Gaithersburg. This industry became the primary employee in town with over 200 workers, and it also provided work for hundreds of migrant workers. New Germany had the same good luck from the railroad, opening a steam-powered flour mill in 1895. Mining also received a boost from the railroad during this period. Gold was discovered near Potomac after the Civil War, bringing several mining companies to the area. Several components of the Maryland Mine there are still visible. Gold mines were also opened near Rock Run and Boyds around this time. The Gilmore Mica Mine continued to operate during this period as well. Milling finally began to wane in Harford County during the Modern period. The industrial establishments in Mill Green, the Lower Deer Creek Valley and Stafford had all withered away during the 1920s. The Reckord Mill in Bel Air continues to operate, however. Quarrying in the Cardiff-Whiteford area had also waned early during the Modern period. Even canning had lost much of its importance by World War II; the Mitchell Company left Perryman in the 1940s. The talc quarry near Dublin has continued operation. The town of Belcamp became the site of an interesting social industrial experiment during the late 1930s. Thomas Bata, a Czechoslovakian shoe manufacturer, had taken his business to England a few years previously in order to escape from the Nazis. 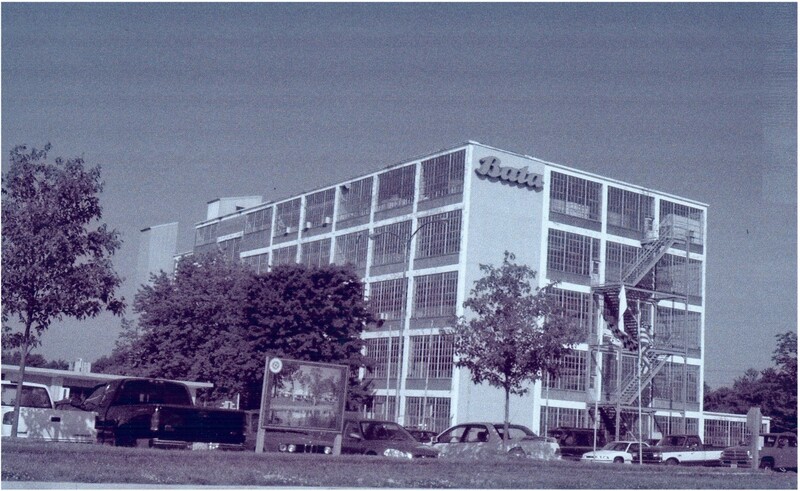 By 1938 the Bata Company was ready to become international, and Belcamp was chosen as the site of an American plant. The company brought Czech immigrants with it to provide labor. In some ways the Bata complex resembled a 19th-century company town, earning it the enmity of local unions. For instance, the workers lived in housing owned by the company. This was not a typical company town, however. It was patterned after the Garden City concept that came out of the German Bauhaus architectural movement. The main aim of Bauhaus architecture was to integrate form and function, and the Garden City was an expanded version of this. For industrial communities, this meant building an all-inclusive system that covered both industry and labor. Thus, part of the ideal behind the Garden City was to supply employees with all of the latest modern comforts—happy workers are productive workers. Consequently, the Bata complex also included a restaurant, a post office and a community center (all owned and operated by the company, of course). The Bata Company remained in business until the late 20th century. The complex was listed on the National Register in 1996, but unfortunately private developers demolished the site to build a resort. It was officially de-listed in 2002. Unlike many other areas of the state, Baltimore County has remained a home to industry during the modern period. Many of the old industrial complexes were converted to new uses. In the 1930s the Reifschnider Company began to manufacture piston rings in the old Franklinville Cotton Factory. During the late 1940s and early 1950s the plant was a plastic manufactory, and beginning in 1954 the Belko Corporation used it to produce rubber belting products. In Oella the Dickey Company remained in business until 1972. Now Oella is a quiet town, but it still has many reminders of its mill town past. From the 1920s to the 1950s the Thistle Factory produced paperboard, and in 1957 it became the New Haven Board and Carton Company. Now it is the location of Simpkins Industries, a paper products recycler. In Rockland, the mill ceased grinding flour in 1922. Throughout the 20th century it has been adapted to manufacture such diverse items as wooden toys, paper products, cake mixtures, bread products and cosmetics. The Joppa Iron Works near Gunpowder Falls was operated as a distillery by the Loreley Company until the 1970s. The Dundalk/Sparrows Point area continued to be heavily industrial. During the Great Depression, unemployed workers were allowed to cultivate small gardens on Bethlehem Steel company property. 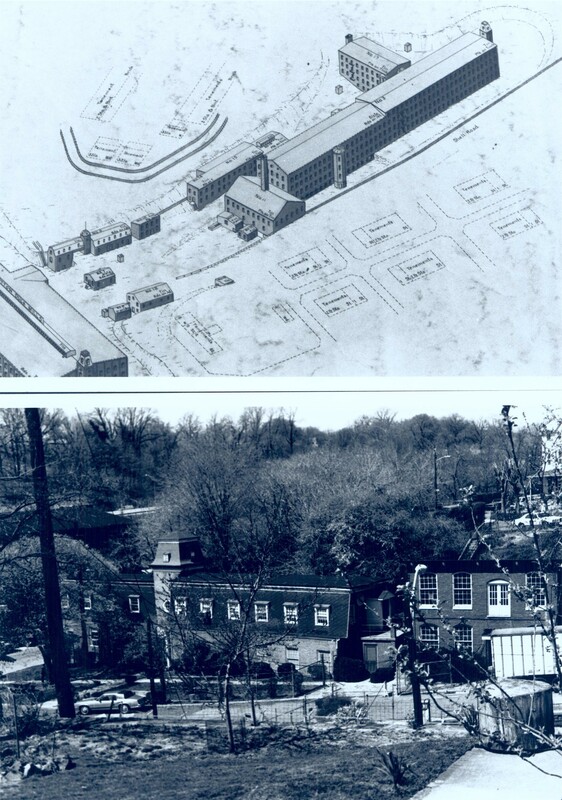 In 1937 the federal government helped to fund the construction of 272 additional apartment units for families, leading to the nickname of “Little Greenbelt” for Dundalk. The steel and shipbuilding industries suffered immediately after World War II from the loss of wartime contracts, but recovered quickly and prospered through the next few decades. The town’s population included people of Irish, English, Polish, Italian, Korean, Japanese and Indian descent. Religion was important to many of the town’s residents, as evidenced by Baptist, Catholic, Lutheran, Evangelical, Methodist, Presbyterian and Episcopal churches. The relationship between these institutions and the labor community is illustrated by the story of one man who worked at the Bethlehem Steel plant in Sparrow’s Point for four years before becoming a minister. During the middle part of the 20th century two steelworkers union buildings were constructed. The steelworkers are still active in one of their buildings. 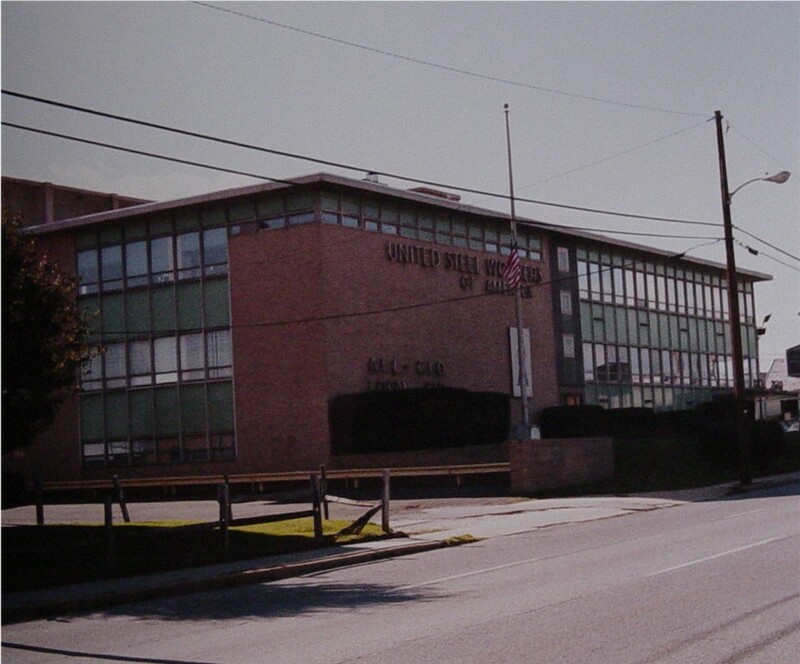 Although the Bethlehem Steel Plant recently closed, several industries still operate in Dundalk, including a Chevrolet Company AstroVan plant. While industry has survived in Baltimore during the Modern period, it is difficult to glean information about it from the Maryland Inventory of Historic Properties. The periods of significance for the Patterson Park/Highlandtown, North Central, Westport, Jonestown, Canton, Fell’s Point, Union Square/Hollins Market, Gay Street, Brick Hill (Woodberry), and South Central Avenue historic districts all extend to the mid-20th century. In addition, part of Dundalk extended over the city line during this period. Camden Yards became an industrial park, losing virtually all of its residential vestiges, by the mid-20th century. As industry slowly declined, the area was remade into an athletic stadium complex in the 1990s. Now, its working-class history (including the famous 1877 B&O Railroad Strike) is barely remembered. The only district named above for which information on the Modern period was included in the MIHP documentation was the Gay Street Historic District. While residential habitation had been eliminated there during the early 20th century, a number of labor unions located there during the 1940s. In 1942 there were at least 25 unions in the district. By the 1960s, however, they had all left. No information on their activities was given. As Howard County settled into its role as a largely suburban region, industry slowly left. In the 1940s the C.R. Daniels Company took over the Sagonan Factory and gave its name to the village previously known as Alberton. The Savage Mill continued to be a major industrial force until the late 1940s. In 1941 the company employed 325 laborers to produce 400,000 pounds of cotton duck per month. After World War II, however, the demand for cotton duck plummeted and the factory closed down in 1948. It was subsequently used as a Christmas ornament factory, but that venture also failed by 1953. In Sykesville, the old Sykes Mill was converted from a cannery to an apple butter factory from 1944 to 1949. In 1989 the complex was used once again, this time to produce patio enclosures for the Sunlight Manufacturing Company. By 1995, however, that business had moved on and the factory was sold to the county. Many industries that were active in Carroll County during the period of Industrial/Urban Dominance could not survive long into the Modern period, perhaps disabled by the loss of railroad transportation. The Mt. Airy Canning Company, established in 1916, went out of business in 1940. The woolen and saw mills in Detour fell upon hard times in the mid-20th century. The entire mill village of Roller was bought and turned into a Western-themed Christian summer camp. In Spring Garden, Hampstead, the Malko Milling and Lighting Company was replaced in 1935 by the Hampstead Milling Company, but this business only lasted until the 1960s. The Otterdale Mill near Taneytown was converted into frozen food lockers. The town of New Windsor, an industrial center as recently as the 1920s, is now a quiet little town. The grist and saw mill in Union Mills closed in 1942. Many of the industrial buildings in Tannery were destroyed in a fire in 1932, marking the end of this town’s most prosperous period. For other previously industrial towns and villages such as Finskburg, Lineboro, Millers, Alesia, Linwood, Oakland, and Bruceville, no information as to industry in the Modern period was included in the Maryland Inventory of Historic Places documentation. Industry did survive in several communities in Carroll County during the Modern period. In 1936 the Blue Ridge Rubber Company located a plant in Taneytown. In Union Bridge, the Tidewater Portland Cement Company continued to be a major employer throughout the period. In Westminster, a factory was built in 1945 that was used to produce artificial rocks in the 1970s. Many of the industries that had been prosperous in Frederick County between 1870 and 1930 declined during the Modern period, but others survived. Doubs Mill continued to operate until the 1940s, while the Benjamin Rice Mill in Jefferson lasted until the 1970s. The Woodsboro Canning Company went out of business during the 1940s. The cannery business in Monrovia survived into the 1950s, and the Glade Valley Milling Company stayed in business in Woodsboro until 1957. Michael’s Mill in Buckeystown, operating since 1824, went out of business in 1957 as well. The Buckeystown Packing and Canning Company couldn’t survive the 1950s. The Thomas Brickyards in Buckeystown, originally opened in the late 18th century, closed in 1974. The Walter E. Burral Lime Plant near New London closed in 1956. The Barrick Lime Works near Woodsboro continued quarrying limestone until the 1970s, while the Fountain Rock Company had stopped burning lime near Walkersville by the early 1950s. 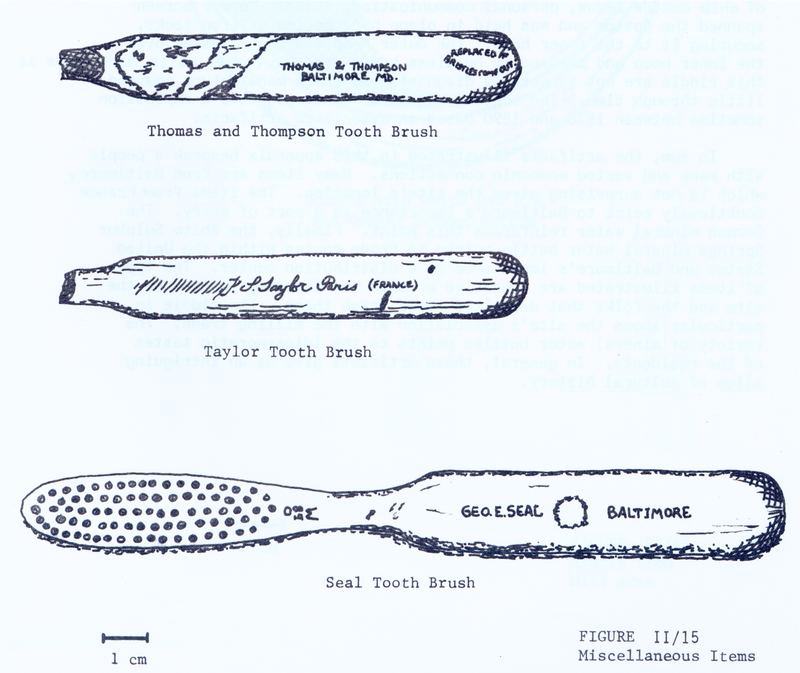 The Ox Fibre Brush Company in Frederick went out of business in 1968. The Brunswick Rail Yard continues to operate, as does the Rosebud Perfume Company of Woodsboro. The growing importance of the federal government as an employer of Montgomery County residents during the Modern period dwarfed any remaining importance of industry. During the second quarter of the 20th century a stone quarrying company bought the Brookeville Woolen Mill and converted it into a residence for one of its quarry managers. Brookeville subsequently became primarily a residential community. The Thomas and Company Cannery in Gaithersburg continued to be a leading employer of that town’s residents until after World War II, but a fire in 1963 forced the plant to close. One interesting new industry did arise in Montgomery County during this period: wormweed distilling. Wormseed oil is used to kill parasites and as an ingredient in perfume. While wormweed has been cultivated in Carroll County since the 1840s, in most places it grows wild. A wormweed distillery was opened in Damascus in Montgomery County in 1939 and operated two shifts a day during the 1940s. As of 1979 this business was one of only two wormweed distilleries remaining throughout the world. Twelve industrial/labor archaeological sites have been recorded in Harford County. Seven of these are mills, including the Husband Flint Mill (18HA93). Only one, Carr’s Mill Complex (18HA262), is reported to contain a domestic component. Of the mill sites, only the gunstock factory at the Jerusalem Mill complex has been more than preliminarily tested. Professional Phase I shovel testing was conducted in the late 1980s, and a high school group excavated there in 1992. Unfortunately, the high school group did not submit a final report to the Maryland Historical Trust. Other industrial sites in Harford County are the Scarboro Soapstone Quarry (18HA68), a charcoal burning facility (18HA231), a slag heap likely associated with the Harford Furnace (18HA50), and the Harford Iron Furnace complex (18HA148). Only the Harford Iron Furnace complex has been investigated. Interestingly, the most extensive excavation there concentrated on a laborer’s dwelling. In the late 1980s Silas Hurry of the Maryland Geological Survey directed excavations of the ironworker’s dwelling at Harford Furnace. The site consisted of a 19th-century duplex, several features (including a privy), and domestic debris scatters. Data retrieval focused on several issues, including the differences between domestic sites inhabited by industrial laborers versus those inhabited by agricultural workers, ethnic and class variability in the use of yard space, and the effect of wage labor on one’s diet. Floral assemblages from the site showed that tenants did not devote time to their own small agricultural pursuits to supplement their diet. In addition, no pollen indicating ornamental flowers was discovered. Nevertheless, planting features were present. This combined information was interpreted to be evidence of transient inhabitants. Faunal remains indicated that the tenants’ diet was very similar to that of agricultural tenants. Time was apparently devoted to small-scale livestock raising, hunting and fishing. Differential landscape use varying with ethnicity could not be determined. However, architectural features suggested that the living environment of the duplex was anything but satisfactory—the house had poor heating and insulation, and with multiple families living there space would have been very cramped. Additionally, evidence for compartmentalization of space was uncovered. The front yard was kept clean of debris, whereas the back yard showed evidence of use as a service/activity area. Two pieces of evidence suggested a higher socio-economic status for the tenants of this duplex than for agricultural tenants. First, a large number of medicinal bottles were discovered, indicating an increasing reliance on commerce and decreasing reliance on home remedies. Second, ceramic index values showed that the tenants apparently had a fair amount of disposable income. This was interpreted as being a result of a wage labor economy rather than a subsistence economy, as in agriculture. Finally, several lines of evidence were combined to suggest a picture of the typical Harford Furnace ironworker. Most importantly, income was used to purchase moveable property rather than invested in home improvements. Hurry concluded that the tenants of this house had been ironworkers who worked at the furnace only as long as it took them to save up enough money to purchase some land of their own and become small farmers. While the information yielded by this site was highly significant, Hurry pointed out that much of the furnace complex and village remained to be explored. Many areas probably retain their integrity and would reveal even further significant deposits. The Harford Furnace Historic District was listed on the National Register of Historic Places in 1990. Thanks in part to its continued industrial growth during the Modern period, a number of industrial/labor archaeological sites have been discovered in Baltimore County. Of the 42 total sites, 33 have industrial components. Of these, 26 are purely industrial sites. These include several mills, including paper, fulling, corn and grist and saw mills. Six of the sites are lime kiln sites, and there is one each of a pottery, a soapstone quarry and a horse stable in Oella. The final five are the sites of the Gunpowder Copper Works (18BA199), the Joppa Iron Works (18BA59), the Granite Manufacturing Company Mill site (18BA196) in Oella, the Northampton Furnace (18BA165) and the Ashland Iron Works (18BA142). Only eight of these sites have been tested, and none have received any more intensive investigation. Of the 16 sites that have domestic or other labor-related components, nine also have industrial components. Six are mill sites with associated houses, including the sites of the Rockland Mills (18BA197) and the Mechanics Cotton Factory (18BA315). The others are the sites of the Bellona Powder Works (18BA139), the Oregon Furnace village (18BA175) and the Phoenix Factory town (18BA182). Only a few of these have been tested, but the Oregon Furnace and Howard McHenry Mill site (18BA100) have received more attention. At the Howard/McHenry Mill site, the Maryland Geological Survey conducted Phase II excavations in the early 1980s. The site consists of a mill, two domestic structures and a probable stable. The mill was a small rural enterprise owned successively by two rich farmers; the millers were tenants, and the historical record provides little information on their identities or lives. The mill was built sometime around the beginning of the 19th century and continued to operate until shortly after the Civil War. Post-excavation analysis focused on the socio-economic status of the tenants. George Miller’s ceramic indexing technique was used to compare the tenants of the Howard/McHenry mill with tenant farmers, skilled artisans and glass workers. Earlier deposits (pre-1840s) suggested that the mill tenants’ status was higher than that of tenant farmers, lower than skilled artisans, and about the same as glass workers. Later deposits, however, suggested that the mill tenants’ socio-economic status was the same as or less than tenant farmers’ status. The authors of the report suggested that this decline in status might have been due to either the development of new milling techniques, making small mills such as this one outmoded, or to the rise of the Mid-Western wheat and milling industry. The investigators urged further research on the continuum of social classes, but determined that the information potential of the Howard/McHenry Mill site had been exhausted. The Oregon Furnace village is the site of an ongoing educational program run by the Baltimore County Center for Archaeology, a part of the Baltimore County Public Schools. Since the 1980s a number of archaeological and historic preservation programs have been offered to students from third grade through high school. The project is directed by a social science teacher and amateur archaeologist, George Brauer. While many of the excavations performed here have focused on domestic worker sites, no excavation reports have been filed with the Maryland Historical Trust. The domestic labor sites recorded in Baltimore County consist of a mill worker’s house (18BA231), three miners’ domestic sites in Texas (18BA313, 18BA314 and 18BA325), a tavern in Texas (18BA324), a school in Oella (18BA475), and a mid-20th century construction camp for Mexican laborers (18BA388) working on the Pennsylvania Railroad near Martin State Airport. Of these, only 18BA231 has not been investigated in any fashion; 18BA388 has only been tested. The Oella School was excavated in 2000 as part of a compliance project. Forty-five shovel test pits (STPs) and two five-foot-square excavation units revealed two loci of domestic debris outside the school, which dates from the late 19th century. Historical research indicates that students and teachers went home for lunch, so the domestic artifacts were interpreted as traces of community functions, such as ice cream socials, that may have been held on the grounds. While the authors of the report state that the archaeological study of schoolyards can reveal information about the games children played, adherence to school rules, and relations between boys and girls, the disturbed nature of many of the deposits at this site precluded such analysis. Due to the general lack of integrity, the authors also suggested that while a privy might contain important information, the search for one would be costly and uncertain of success. The four sites in Texas were all excavated by Mid-Atlantic Archaeological Research, Inc. from the mid-1980s to the early 1990s. The excavations included Phase I through Phase III investigation. During the second half of the 19th century Texas was a community of Irish immigrants who quarried limestone and operated limestone kilns. The district, which includes residences, quarries, and kilns, was nominated to the National Register in the mid-1980s. Three sites were selected for data recovery: 18BA313 (a row of four houses and a possible store), 18BA314 (a multiple-family residence), and 18BA325 (another duplex). Research issues included socio-economic behavior (some residents were laborers, while others were managers), dietary practices and evidence of Irish ethnicity. Site 18BA313 yielded rear-yard trash deposits and privies. Only one artifact had ethnic associations: an 1880 medal with a Latin religious inscription, providing evidence of Catholic religious beliefs prevalent among Irish immigrants. Site 18BA314 also yielded a religious medal, as well as two pipe bowls with designs advocating Irish Home Rule. Interestingly, this site also yielded several military buttons, including a Confederate button. The investigators noted that Irish immigrants gained a measure of acceptance in American society through participation in the Civil War. Site 18BA325 did not yield any material evidence related to Irish ethnicity. Socio-economic status of inhabitants was determined through historical research, while the archaeological evidence was largely equivocal. Residents of the dwelling at 18BA314 were of lower economic means than residents of the other sites. 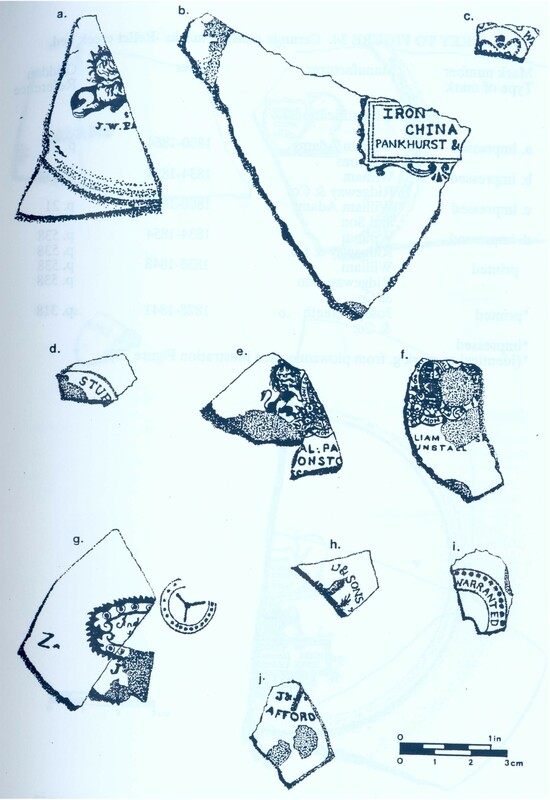 All three sites, however, had an assortment of ceramic types, indicating similar consumption patterns. All three sites also yielded faunal remains of meat bought at the company store, including shellfish. The existence of shellfish remains at site 18BA314 was attributed to landlord beneficence rather than residents living above their means. The residents of 18BA314 also consumed more fowl and fish harvested locally, indicating a lower income. Site 18BA314 was judged to be the only site with enough intact deposits for an analysis of patterned behavior. 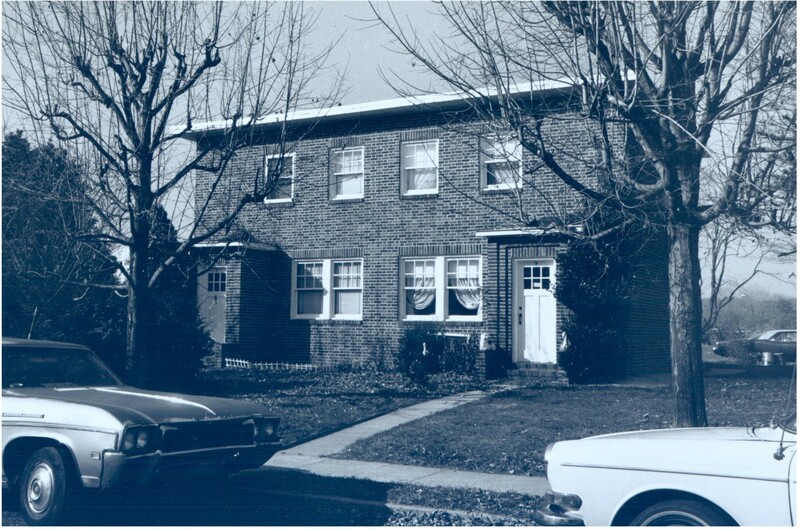 Three analytical goals were outlined: To determine if the residents of the dwelling were families or single men; to determine if there was evidence for specific activity areas or structural subdivision; and to compare behavioral patterns from this rural community with those from an urban Irish immigrant community in Wilmington, Delaware. Excavations revealed decorative hair combs, a scent bottle, housework items, and stocking garters, indicating the presence of women. Similarly, children left behind marbles, dolls, a toy pistol and a toy tea set. Thus, the site was most likely inhabited by families rather than bachelors. Spatial analysis seemed to indicate that only one family had lived at the site, but this was interpreted as misleading evidence caused by a fire that leveled the structure during the late 19th century. Comparison with the urban site in Delaware indicated several similarities as well as several differences. Similarities included an abundance of inexpensive, mass-produced goods; basic, unadorned housing; similar personal hygiene habits and access to health care; and minimal evidence of ethnic identity. Differences were abundant, as well. The urban site evidenced more formal dining practices, a greater reliance on commercially purchased food, faster adaptation to new domestic technologies, different attitudes towards child-rearing, and a clearer distinction between work space and domestic space than were present at 18BA314. As might be expected in a large city, an extensive amount of compliance archaeology has been conducted in Baltimore City. Much of this was done by the Baltimore Center for Urban Archaeology (BCUA) in the 1980s and early 1990s, although R. Christopher Goodwin & Associates has also done a significant amount (including the Camden Yards excavations in the early 1990s). As a result, a large number of industrial and labor archaeological sites have been recorded—66 in all. Twenty-seven of these sites have only industrial components, 32 have only labor components, and seven are mixed. The industrial sites form a diverse group. Five of these sites are wharves, all of which have been excavated by the BCUA. The most famous of these is the Cheapside Wharf (18BC55). Goodwin uncovered a pug mill (18BC89) and a brick kiln (18BC90) during its Camden Yards excavations. A portion of the site of the American Can Company (18BC56) in Canton was excavated by the BCUA in the early 1990s. Two breweries, one in Fell’s Point (18BC57) and the Claggett Brewery on Lombard Street (18BC38) were also excavated by the BCUA. A third brewery (18BC108) in Fell’s Point was excavated by its owner before the BCUA was asked to look at the site. Two small mills in northwestern Baltimore have been tested, but not fully excavated. Two other mills have been identified but not tested. Six shipwrecks near the Hercules Shipyard in the harbor have been identified and grouped as one site, but not investigated. Other industrial sites include three early potteries (18BC1, 18BC5 and 18BC28), two sand mines near Federal Hill (one of which, 18BC95, has some graffiti on its walls from miners), a stone quarry east of Dickeyville (18BC119) and one near Windsor Hills (18BC121), a tobacco pipe factory (18BC39), a spring water production site in Rognel Heights (18BC96), a shed associated with a mill near Dickeyville (18BC42), a bakery (18BC137), the former site of an iron foundry and lumber mill (18BC67), and a glass factory on the south side of the harbor (18BC11). Only one of the sand mines, the mill shed, the iron foundry/lumber mill and the bakery have been tested. 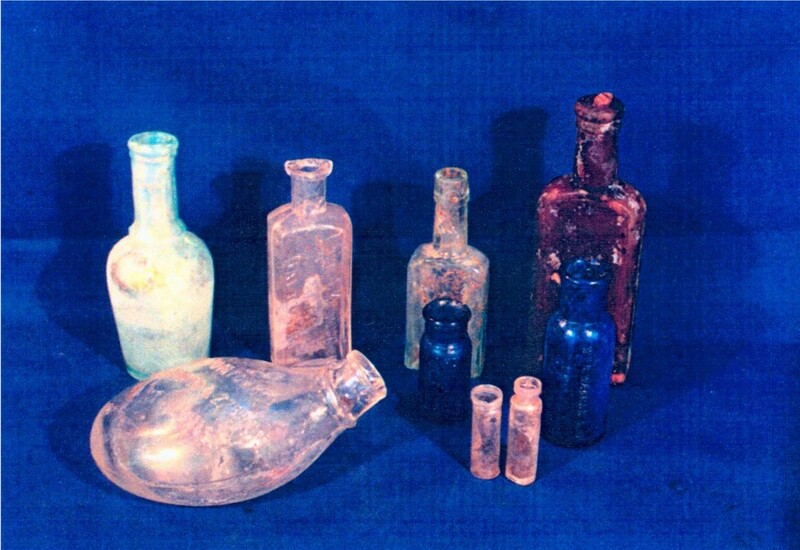 The glass factory and the Thomas Morgan Pottery (18BC1) were excavated by the Archeological Society of Maryland in the early 1970s. The mixed sites also present a diverse picture. The Mauldin Perrine Pottery (18BC20) includes a residence. Testing there in the 1970s revealed a significant amount of domestic artifacts, but no further work was done. An 18th- and 19th-century warehouse with a domestic component (18BC99) has been identified in Fell’s Point, but not excavated. The site of the Baltimore City Life Museums (home of the BCUA) was found through archival research to have once been a seafood packing house and worker tenements (18BC68). Two other sites, the Shot Tower Metro Station site (18BC69) and MSA-10 (18BC87, excavated during the Camden Yards project) contained both industrial and domestic components, but not enough information was obtained to determine the nature of the sites. The Franklin Mill Complex in Dickeyville (sites 18BC40 through 18BC44) consists of three buildings, including the mill, a storage shed and the superintendent’s house. 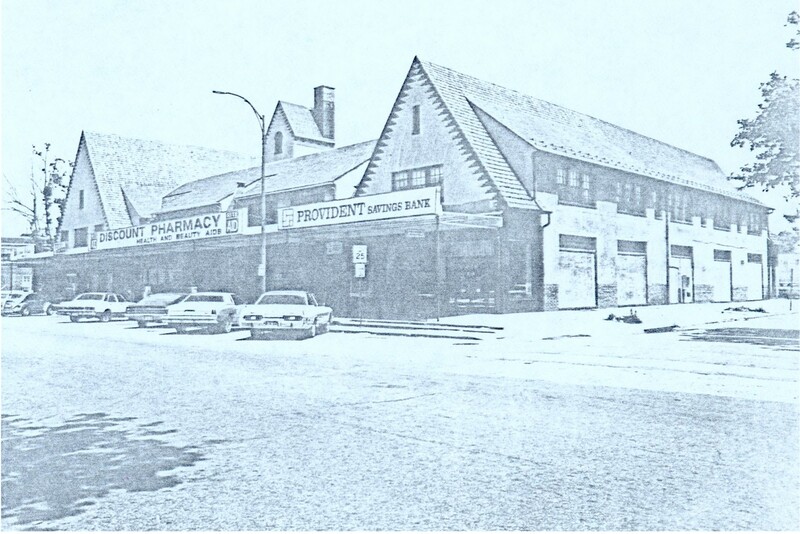 This site was investigated by the BCUA in the early 1980s. Several industrial enterprises were located in this area during the late 1700s and early 1800s, including the Tschudi (or Tschudy) Paper Mill and the Franklin Paper and Woolen Mills. By 1844 the Ashland Cotton Factory had been built on the site of the old Tschudi Mill. Fires and floods plagued the mills during the second half of the 19th century, but they remained in business through the first half of the 20th century. Site 18BC41 was identified as a domestic site, while 18BC42 was identified as a shed. Unfortunately, these sites were determined to hold little significance and thus not investigated. However, a structure thought to be a tenement or a superintendent’s house from the 1870s (part of site 18BC40) revealed evidence of industrial activity, suggesting that it may have been part of the earlier Tschudi or Franklin Mills. No further analysis of the assemblage was conducted, however. The majority of the labor sites in Baltimore City are domestic sites, and several have been destroyed by development. The Archeological Society of Maryland excavated four domestic sites (18BC125, 18BC128, 18BC129 and 18BC130) near the Inner Harbor on York and Hill streets in the late 1960s. While deposits were uncovered, no excavation beyond preliminary testing was carried out. The sites have since been destroyed by the construction of a hotel. A number of domestic, industrial and commercial sites were recorded during the Camden Yards excavations (18BC78 through 18BC90). Sites 18BC80, 18BC85 and 18BC90 were semi-rural residential sites from the mid-19th century. Sites 18BC78, 18BC82, 18BC83, 18BC86, 18BC87 and 18BC90 were late 19th and early 20th century working-class urban sites. Site 18BC79 was the Ruth Saloon, owned at one point by Babe Ruth’s father. A number of these sites, unfortunately, had been disturbed by rowhouse demolition and subsequent activity. Excavations at the Ruth Saloon proved disappointing. The Ruth family owned and resided there from 1906-1912, hosting a clientele largely drawn from the area’s industrial workforce. Artifacts recovered from the site, however, dated to the early 19th century, when it was a middle-class residence. A domestic refuse feature and a large assemblage of ceramics were discovered at 18BC85, a site that began as a ropewalk in the early 19th century, became a residence in an area inhabited by English, Irish, German and Italian immigrants during the mid-19th century, and evolved into a commercial and light industrial area by the end of the 19th century. Unfortunately, no analysis was performed. Similarly, a privy associated with early 20th-century African American laborers and porters (18BC81) received minimal interpretation. Faunal evidence indicated that while beef was bought already prepared by residents, chicken was prepared on site. Other than this, however, the report merely concludes that the assemblage was “consistent with the socio-economic status and the historically documented activities” of the site’s residents. Three other sites, 18BC80, 18BC87 and 18BC90, were also working-class laborer’s residences during the last half of the 19th century, but little or no analysis was offered despite the presence of intact deposits. Overall, the Camden Yards investigators offered the following analysis: The material culture that was recovered represented a microcosm of 19th-century Baltimore, illustrating a decline over time in the project area from affluent to working-class inhabitants, from owners to renters. The quantity and quality of ceramics were found to more accurately reflect socio-economic status than variety of ceramics. Also, socio-economic decline could be seen in meat consumption and butchering patterns. Earlier deposits yielded remains choice cuts that had been scraped, chopped and cut, whereas later deposits yielded remains of less expensive cuts that had been sawed. Several of the Camden Yards sites were preserved under parking lots, but others were destroyed to make way for Oriole Park at Camden Yards and a football stadium. Two mill-related domestic sites have been recorded. The first, 18BC115, is a circa 1840 mill foreman’s residence; it has not been tested. The other, 18BC41, is a workers’ residence near Dickeyville. It was tested in the early 1980s, but has since been destroyed by the Gwynns Falls Sewer Interceptor. A number of domestic working-class sites have been identified in the eastern half of the city. A site excavated for the H&S Bakery, 18BC32, revealed extensive intact deposits relating to a 19th and 20th-century working class residence in the Fell’s Point Historic District. The authors of the report suggested that further excavation could yield important data relating to status, ethnicity, religious affiliation, occupational types, and variations in lifestyle. A site on Front Street (18BC14) that had been the site of trades shops and working-class dwellings during the 19th century was tested in the mid-1970s. Several unidentifiable features were located, but no further excavations were performed. The Albemarle Rowhouse sites (18BC48 through 18BC50) were excavated in 1984 and 1985, but no report was written at the time. Ten years later, the Baltimore Center for Urban Archaeology pieced together a report based on fragmentary notes, maps and photographs. The site was occupied by wealthy residents during the first half of the 19th century, but by immigrant laborers during the second half. Four privies, three pits, a hearth, a cistern, a French drain and a root cellar or beer vault were discovered. Unfortunately, the report offered no analysis; the author did suggest, however, that the collections should be rigorously analyzed in the future. R. Christopher Goodwin & Associates has excavated a number of domestic sites in the city within the past ten years, but unfortunately few of them retained integrity. Four sites were discovered during preparations for the new Baltimore Convention Center (18BC102 through 18BC105), including 19th-century rowhouses (some with commercial components) and a light industrial area. During the early 20th century the area was inhabited by Eastern European immigrants who labored in factories, but these residents left no intact deposits. In the area once known as the Loft, the center of Baltimore’s late-19th-century and early-20th-century needle trades, two domestic sites were identified and tested (18BC117 and 18BC118). Unfortunately, the archaeologists concluded that the deposits, while intact, were not uniquely representative of working-class sites, and that the information contained by the sites was internally redundant. Thus, no further excavations were carried out. From 1996 to 1998, Goodwin & Associates identified eight sites (18BC131 through 18BC137 and 18BC139) on land slated to become a new juvenile justice center in the Jonestown area of Baltimore. These included an early 20th-century parking garage, 19th-century African-American (both skilled and unskilled laborer) alley dwellings, several 19th-century rowhouse sites (one of which had also functioned as a sugar refinery) and the site of the early-20th-century Rice Baking Company. Four sites were chosen for Phase III archaeological mitigation, including the African-American alley dwellings (18BC132), a late-19th to early-20th century privy shaft associated with a middle-class militia group (18BC133), the site of the sugar refinery (18BC135), and a rowhouse site that also served as a tavern and hotel from the late 18th through early 20th centuries (18BC139). Research objectives for site 18BC132 included developing a database for early-19th-century urban free African-American occupations, including the delineation of ethnically-specific patterns of spatial organization. Unfortunately, disturbed lower deposits precluded a diachronic analysis of landscape use. However, later deposits were compared with other data from archaeological excavations of African-American sites, especially those reported from Annapolis by Paul Mullins (1999). The investigators discovered that the deposits from 18BC132 differed from others in that there was no evidence for the use of wild plant resources to supplement the diet, both local and national brand name commercial goods were purchased (as opposed to mainly national brands in Annapolis), and a reliance on fish and shellfish in the diet was evident (Mullins had proposed that African-American Annapolitans had not utilized these easily available resources in an attempt to distance themselves from the white assumption of laziness associated with seafood procurement). Site 18BC135 functioned as a sugar refinery during the first quarter of the 19th century. From the fourth quarter of the 19th century through the first third of the 20th century, however, the site was occupied by Russian and Italian garment workers. 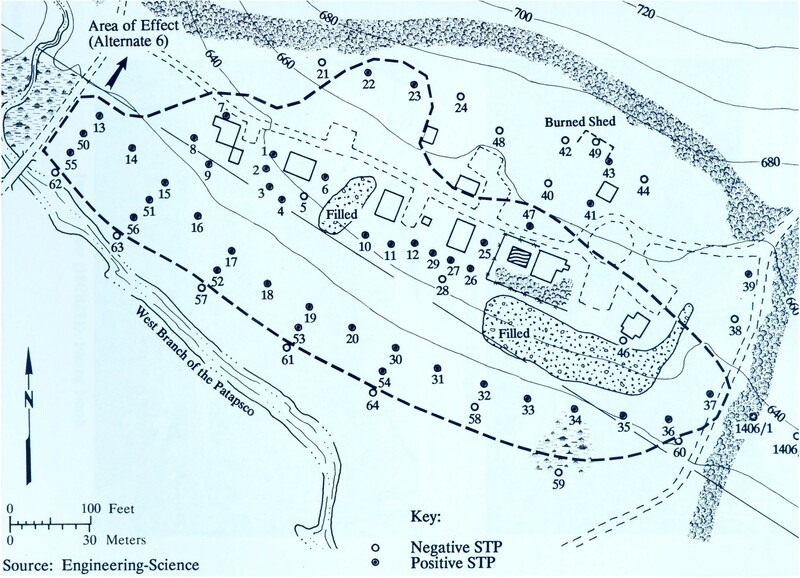 Research objectives for this site included a diachronic landscape reconstruction and an analysis of privy shafts to examine questions related to ethnicity. The landscape reconstruction showed that after the Civil War the area became much more densely populated, and by the 20th century utility trenches and sewers had been extended to the area. One privy that was excavated revealed a reliance by German immigrants on local German merchants, and even the procurement of imported German goods. Another privy associated with Yiddish garment workers was the only one to lack pork remains, indicating the residents’ Jewish identity. The investigators concluded the report by acknowledging that the analysis of the massive database formed by the excavations had only just begun. Preliminary analysis suggested that 19th- and early-20th century residents of the area were separated more by economic class than by ethnicity in most areas of material culture, but not in the floral and faunal assemblages recovered. The discussion of landscape in the report focused more on methods of recovering landscapes than on an analysis of the landscapes recovered; this is an area that could be tackled by future researchers. The remaining four labor sites in Baltimore City are all related to religion. The Orchard Street Church (18BC54) has not actually been excavated, but construction work has been monitored by professional archaeologists and material has been recovered. Recently the BCUA conducted test excavations at the Lloyd Street Synagogue (18BC143) in Fell’s Point. Undisturbed deposits were encountered, but the excavation objectives were limited to recovery of architectural data. Site 18BC138, another synagogue in Fell’s Point, has been partially excavated by the BCUA. A report is still pending. The Hampstead Hills site (18BC111) near Johns Hopkins Hospital underwent Phase II excavation by the BCUA in the 1980s. This site was primarily a mid-19th-century to early-20th-century residential neighborhood for working-class African Americans and Eastern European Jews, but it also includes portions of the old Christ Church and Potter’s Field cemeteries. The excavations identified 37 burial shafts as well as intact structural features, privies and yard deposits. No excavation report could be found in the Maryland Historical Trust Library. The site was determined eligible for the National Register of Historic Places, but has not been listed. Twenty-Two different industrial/labor archaeological sites have been recorded in Howard County. Seventeen of these sites are industrial. They include seven mills, varying from saw to grist to cotton mills. One of these sites is the former Guilford Factory (18HO108). Only one of these sites, the Cricket Creek Sawmill near Clarksville (18HO191), has been tested, and shovel tests did not reveal any cultural features. The other industrial sites include two soapstone quarries (18HO1 and 18HO3), two mica/quartzite quarries (18HO67 and 18HO106), a granite quarry associated with Guilford (18HO109), four lime kilns (18HO65, 18HO112, 18HO113 and 18HO114), and a charcoal burning area possibly associated with the iron industry (18HO241). Only sites 18HO106 and 18HO241 have been tested, and they too failed to yield any remains. The remaining sites are all labor sites, although none are workers’ residences. The site of the All Saints Church (18HO250) between Laurel and Savage has been tested but revealed few intact deposits. The site of the 19th-century Ellicott City Colored School (18HO218) was also tested and found to have little integrity, but two privies that may contain intact deposits were not excavated. A site described as a rural industrial plantation (18HO175) has also been tested, but apparently a report was never completed. A domestic site thought to be related to the Jane Nicholls’ Mill (18HO86), Adams-Nicholls (18HO153) was once the home of the mill owner. The company Greenhorne and O’Mara discovered this site as part of a Phase I survey in 1990. Phase II excavation was suggested. If performed, such excavation could provide significant information on small mill owners’ lives to compare with information about custom mill workers’ lives. Perhaps the most important site in Howard County is the Simpsonville Stone Ruins site (18HO80). This site encompasses most of what was once the village of Simpsonville. A small mill was located here during the mid-18th century. Sometime before 1860 a woolen factory and a second mill were constructed; during this period the village was known as Owingsville. The woolen factory employed about 17 people, both men and women. A blacksmith and wheelwright were also in business. By the 20th century only one of the mills remained, paying one employee $15 per month in 1919. The mill burned to the ground during the 1920s. Determined eligible for the National Register but not listed, the Simpsonville Stone Ruins have been excavated by four different groups, yielding tens of thousands of historic artifacts. 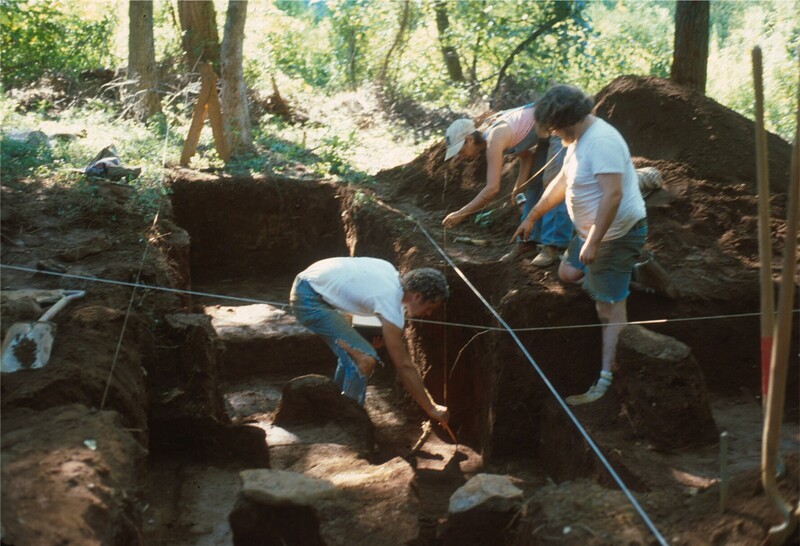 The first two groups to perform excavations at the site, Antioch College in the early 1970s and the Upper Patuxent Archeology Group (UPAG) in the early 1980s, did not produce reports. Phase II testing was carried out in 1989 and 1990 by GAI Consultants, Inc. The investigators located a possible sawmill and a domestic/commercial site, as well as the stone mill ruins which give the site its name. Stratified deposits and intact features were still present, so additional work was recommended. Phase III archaeological data recovery was conducted in 1992 and 1993 by John Milner Associates. Research questions focused on the evolution of the community from its beginnings to its decline, the relationship between the natural and built environments, and the relationship of Simpsonville in the larger economies of Howard County, Maryland, and the United States. Unfortunately, the archaeologists were not able to locate any further intact domestic deposits, and so the archaeological record did not contribute much to a social analysis of the village. A total of 23 industrial and/or labor archaeological sites have been recorded in Carroll County. Many of the 16 industrial sites are mill ruins or old lime kilns. Several of the mills also have domestic components. Of the five labor sites, a church, a hotel, and working-class sites in Westminster and Tannery are represented. Of the 16 industrial sites, eight are mill ruins or mill complexes, including Bachman’s Mill (18CR178). Two of the mill sites have domestic components. Five of the mill sites have been tested, including both of the mills with domestic components. One of these, the Union Mills Homestead Complex (18CR166), was more extensively investigated during the mid-1980s in advance of structural rehabilitation. Research objectives included uncovering information on the house’s residents for museum interpretation and structural evidence for a now-demolished porch-pantry addition. The site was the center of a small community during the 19th century that included saw and grist mills, cooper and blacksmith shops, a tannery, a cannery, a post office, an inn, and a farm. The archaeologists hypothesized that the millers were single men who took their meals at the main house, but this was disproved by the presence of a large number of kitchen artifacts and toys, indicating a family. The archaeologists had also expected to confirm the Pennsylvania Germans’ reputation for cleanliness through a lack of front yard deposits; this was also determined not to be the case. The artifact assemblage from the Union Mills Homestead site revealed two more interesting insights. The artifact patterns fit the Public Interaction pattern, just like the assemblage from the Sharpe-Ridout-Boone Mill in Anne Arundel County. Perhaps more importantly, there was a large percentage of redware as compared to stoneware, a trait of the Pennsylvania German cultural tradition. This group had continued to use redwares long after most other groups had abandoned its use to avoid lead poisoning (redware often has a lead glaze). The homestead was listed on the National Register of Historic Places in 1971, and is now a museum property. Three sites are quarries, including a rock quarry (18CR19) and a pegmatite quarry (18CR20) in Patapsco State Park and an unknown quarry type near Westminster (18CR215). Only this last has been tested, but not extensively. Site 18CR184 is an iron ore mine possibly associated with the 18th-century Avondale Furnace near Westminster. It too has been tested, but not extensively. The Avondale Furnace itself has been recorded as site 18CR24, but apparently only on the basis of informant information. No professional archaeologist ever seems to have visited the supposed site. Four more of the industrial sites are lime kilns. One near Tannery (18CR213) has been tested, but the most important kiln, the Fenby Farm Quarry and Lime Kiln (18CR163) in Westminster, was extensively investigated in 1997. Excavations focused on questions of site size, function (local tradition held the site to be an iron furnace), architecture, economics and the site’s relationship to agriculture. While historical research revealed that the operation employed several full-time laborers in the 1850s, no questions about labor were addressed by the excavations. Two archaeological sites have been recorded in the town of Tannery, just outside of Westminster. One is the tannery itself (18CR222) and the other is the site of six houses built during the late 19th century to house tannery employees (18CR221). Site 18CR222 was only mapped and photographed to provide a context for site 18CR221. The village of Tannery developed during the late 19th century with the growth of the railroads, and by the early 20th century it included the tannery, a distillery, a railroad depot, a church, a school and a general store. Phase I testing of site 18CR221 revealed a trash midden, and the investigators felt that there was a high probability for other surviving features such as privies. The four remaining labor sites are all clustered in Westminster. Just outside the city limits, Krider’s Church Cemetery was located during a Phase I survey in the early 1990s. Two sites, the Eastern Hotel (18CR243) and a domestic well (18CR242), were discovered during archaeological monitoring of street improvements. However, these sites were just mapped and protected under pavement. The final labor site in Westminster is the Shellman House (18CR185), now a museum. This site is actually more of a “management” site than a labor site: Two of the house’s early occupants were David and Andrew Shriver, who built the grist mill and tannery in Union Mills in the 1790s. Thus, information from this site combined with information from the Union Mills Homestead Complex provide an opportunity to compare the lives and material culture of early industrialists with that of their employees. Limited excavations here focused on the portions of the site that were to be disturbed by street improvements. Frederick County has an amazing 63 industrial/labor archaeological sites on record. Nineteen of these, however, are sites within the Catoctin Furnace complex. They will be discussed separately. Of the remaining 44 sites, 36 are industrial sites, six are labor sites, and two have components of both. Of the industrial sites, twelve are individual or grouped charcoal hearths. None have been investigated, but they are all likely associated with the 19th-century lime-burning industry. Seven lime kilns have been recorded as archaeological sites. Only one, the Ft. Detrick Lime Kiln (18FR682), has been investigated. Twelve more of the industrial sites are mills of various descriptions. Only three of these have been tested (18FR403, 18FR633 and 18FR644), and only the Shriner site (18FR633) has been intensively excavated. However, even these excavations were not enough to determine conclusively whether or not the site was a wheelwright or blacksmith’s shop rather than a flour mill. Two tanneries have been recorded and excavated. The tannery on the property of the George Willard House in Jefferson (18FR696) was only tested. The Birely Tannery in Frederick (18FR575) has been investigated several times, most recently by Mid-Atlantic Archaeological Research in the late 1980s. Archaeological and historical evidence suggested that areas devoted to particular steps in the tanning process were set up in an assembly line fashion. Only five to six unskilled workers were needed to run this small operation. Two glass factories have been located in Frederick County. The Staley Glass Works site (18FR372), north of Frederick, has only been tested. Johann Friedrich Amelung’s New Bremen glass manufactory (18FR16), however, was located and partially excavated in the 1960s by a joint project of the Corning Museum of Glass, the Smithsonian Institution and the Colonial Williamsburg Foundation. The excavations were directed by Ivor Noël Hume. The project was originally intended simply to recover examples of Amelung glass that would be useful to scholars of glass history, but the excavations uncovered the burned foundations of an industrial building. After clearing this building during a second excavation season, the project was abandoned for lack of funding. Noël Hume lamented the fact, however, that the project had not had the time to investigate any features that might have shed light on the workers’ lives, stating that the “whole sociological, industrial, architectural, and artistic story of New Bremen needed to be told.” Apparently a Smithsonian Institution staff member did return to the site later and began excavating a worker’s dwelling, but quickly abandoned the project and failed to finish a report. Two of the three remaining industrial sites are extraction sites. In 1993 John Milner Associates tested site 18FR689, known as Clay Pits. This site was probably associated with a nearby brickyard. Part of the site has been used as a garbage dump for the city of Frederick during the 20th century. Site 18FR606, Little Fishing Quarry, is located in the City of Frederick Municipal Forest. It has not been tested. The final industrial site, Brewery, City Site #4 in Frederick (18FR573), was tested during the early 1980s during a routine cultural resources survey. Two of the industrial sites recorded in Frederick County are associated with domestic sites. The 18th- or early-19th-century Pearce Mill (18FR365) near Utica is accompanied by the remains of the Pearce Mill House (18FR366). A lime kiln of unknown date near Buckeystown (18FR350) is similarly associated with a cellar and house foundation (18FR349). None of these sites have been tested. Besides the two domestic sites just mentioned, four archaeological sites possibly related to labor (and not a part of the Catoctin Furnace complex) have been recorded in Frederick County. A domestic refuse scatter in Burkittsville (18FR756), probably associated with a store and residence, has received only preliminary testing. The Woodsboro Town Dump (18FR609), active from the 1900s to the 1950s, has been recorded but not tested. The other two sites, Tavern, City Site #3 (18FR572) and the African Methodist Episcopal Church (18FR574), were both located during an archaeological survey of Frederick during the early 1980s. The area of the tavern (which historical research suggests was not actually a tavern) was inhabited by African-American laborers throughout the 19th century. Artifacts recovered from the tavern site indicate a domestic residence; virtually no artifacts were recovered from the church site. 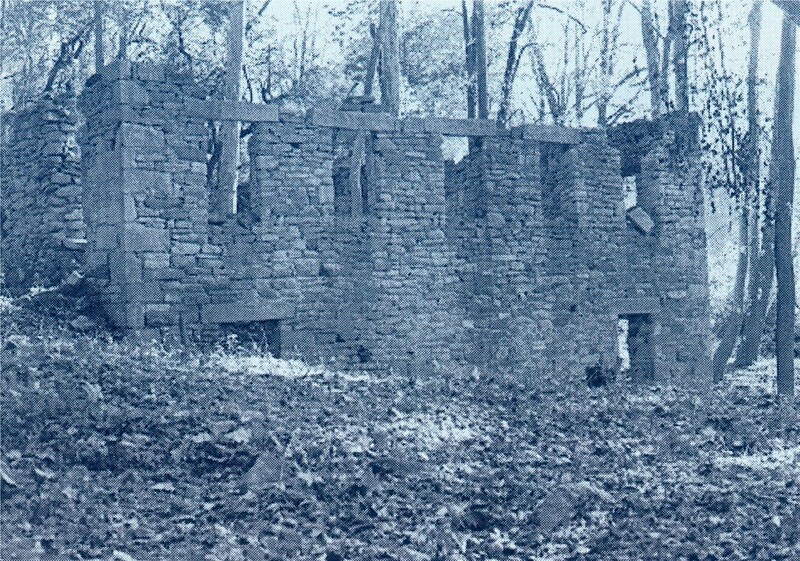 The majority of the individual archaeological sites recorded within the Catoctin Furnace complex are industrial sites. The complex as a whole has been assigned the site number 18FR29. Industrial sites within the complex include a raceway, a race pond, a limestone quarry and kiln, a casting shed, a retaining wall and shoring cleats, an ore washer pond, an ore mine and railroad tracks, three clustered ore mines, another limestone quarry, a foundry, and an ore pit behind what was once the iron master’s house. This last site (18FR390) was used as a trash dump for the residence beginning in the late 19th century. The sites related to the employees of the furnace include two cemeteries (18FR323 and 18FR326), the iron master’s house (18FR720), and three other houses used as workers’ dwellings (18FR324, 18FR584 and 18FR735). The complex was listed on the National Register of Historic Places as a district in 1972. Many of the industrial sites were located during exploratory excavations in the 1970s, aimed at developing a preservation plan for the site. One of the cemeteries (18FR323), however, has been the focus of considerable study. Approximately one-third of a slave cemetery dating from about 1790 to 1840 was excavated in advance of a road widening, yielding 35 graves. The material culture associated with the human remains was sparse. Grave locations were only occasionally marked, and then only by small unmarked head and footstones. Most of the graves showed evidence of coffin burials, and the nails from the coffins were the primary basis for dating the graves. The archaeologists recognized the problem inherent in this method, however, as many of the nails used may have been older or re-used nails. A few of the graves yielded shroud pins, and at least four graves included buttons from clothing. Many of the men, women and children had been buried facing west, an indicator of Christian religious beliefs. However, this may have been due to control by the slave owners rather than from any sincere religious belief on the part of the enslaved laborers. Finally, only a few botanical traces (blackberry or raspberry seeds and sassafras seeds) were present to suggest burial offerings of any sort. Skeletal analysis revealed more information on the lives of those buried in the Catoctin slave cemetery. Thirty-one of the skeletons were analyzed. Seven were infants or fetuses, nine were children (under the age of 15), and 15 were adults (eight female, seven male). The average age for men was about 42 years, while the average age for women was only about 35 years (perhaps due to factors related to childbirth). None of the enslaved laborers revealed an obvious cause of death, but poor health during childhood was common. Many of the skeletons evidenced childhood rickets, caused by a deficiency in vitamin D. Teeth were commonly worn as if from a coarse diet, but several people had otherwise good dental hygiene. Many of the crania had short skull bases, indicating stunted growth. Traces of muscle strength and stress on bones revealed to researchers who commonly lifted heavy weights, as would be expected at an ironworks; this was not limited to only the men. Similarly, a few skeletons, both men and women, showed evidence of skilled craft labor through arthritis in the hands. Fractures, other injuries and bowed tibiae illustrated the dangerous nature of the work performed at an ironworks, although the rate of bone fracture in this sample was similar to that in other (non-ironworking) populations. Two of the domestic sites at Catoctin Furnace have also been tested as part of ongoing site monitoring activities. In the early 1990s the Reed-Stitely House (18FR735), a worker’s dwelling from the mid-19th century into the 1920s, was tested. Research questions were divided into four categories: impacts of the furnace on the quality of life of its workers, local economy and trade, management practices, and how workers adapted to the closing of the furnace in 1923. Specific questions under the first category included whether or not living in a company town inhibited access to food and other commodities, and the relative socio-economic status of the house’s residents as compared to other Catoctin Furnace workers, workers in other iron furnace towns, and other segments of society. Under the second category, questions were asked about the nature of the furnace’s participation in local and regional market networks and the types of goods available to workers. Concerning management practices, the investigators wanted to know how frequently the house’s occupants changed and what kinds of improvements the company made to the property over time. Finally, the archaeologists wanted to know if a wider or narrower range of goods was available after 1923 than before, whether the architectural elements of the house or refuse patterns changed, and what might have caused such changes. The report did not answer these questions, but the investigators concluded that the wealth of material recovered from the site was adequate to address most of them. The only exceptions were the questions about post-1923 occupations, since the overwhelming majority of the artifacts recovered date from before the 1920s. 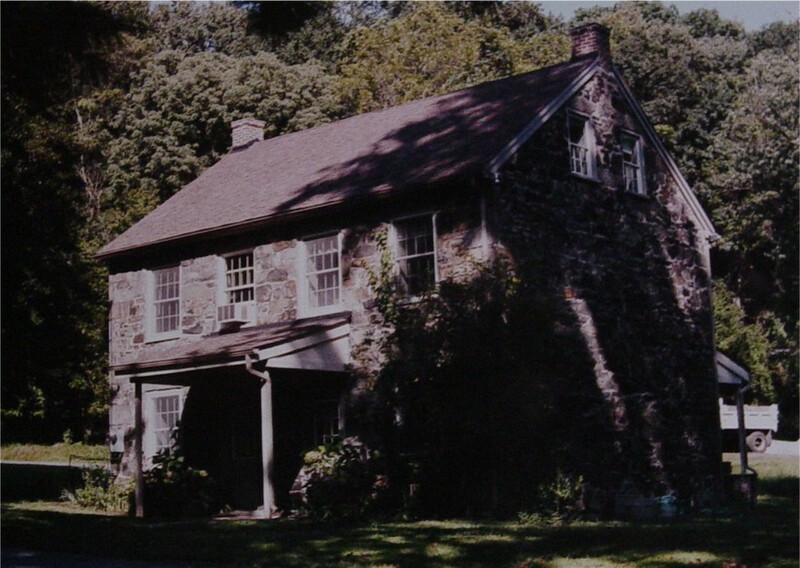 The Iron Master’s House (18FR720), home to a series of furnace administrators from about 1780 to 1900, yielded a significant amount of artifacts and features during archaeological monitoring of new construction during the 1990s. While this site offers the opportunity to compare the domestic lives of high-status people within the furnace community with those of lower-status people, the data for such an analysis is still buried. Montgomery County has a large number of industrial/labor archaeological sites for a county with as little industry as it has had. Most of these sites, however, are small agricultural mills located as part of the work of the Maryland-National Capital Parks and Planning Commission. In fact, 28 of the 39 sites are mills or some portion of a former mill complex. Most are grist, saw or woolen mills, and many are only known from the remains of their raceways. Of the 28 mills, only four are known to have associated domestic components. Twelve of the mills have been tested, including three of the four with domestic components. Site 18MO389, the Hyattstown Mill and Miller’s House, is the most extensively investigated mill site. Six excavation units were opened during a Maryland-National Capital Parks and Planning Commission survey, but no report has been completed. One site without a domestic component does have an interesting story about labor attached to it. The site known as Devil’s Den (18MO550) in Silver Spring consists of a 60-foot-long tunnel built as part of the dam system for a turbine feed mill complex in the 19th century. It is rumored that this tunnel was dug out by a slave who was given his freedom when he finished the job. No testing has occurred here. Of the 11 sites that are not parts of mills, nine are industrial and two are labor sites. The industrial sites include three gold mines (18MO147, 18MO485, and 18MO506), four stone quarries (18MO24, 18MO101, 18MO352, and 18MO454), a 20th-century railroad facility in Chevy Chase (18MO415) and a lime kiln of unknown date (18MO529). Sites 18MO101, 18MO147, and 18MO415 have all been tested. Site 18MO101, the Seneca Sandstone Quarry, includes the quarry master’s house and possibly some workers’ sheds. The quarry master’s house was renovated in the early 1980s. Neither of the two labor sites in Montgomery County has been tested. The Moore Quarry Worker’s House (18MO486) stands near Emery Corners. The entire former village of Triadelphia (18MO27), a 19th-century cotton mill town, now rests underneath a lake created by the Brighton Dam. The protection afforded by the water may have allowed the preservation of many features that could yield significant information about the lives of the town’s residents, if underwater archaeologists ever examine the site. Historians of Baltimore City have been the most active in documenting both labor and union history. Some of the more important books that have been published about unionism and labor in Baltimore are The Baltimore Book (Fee et al. 1991), Making the Amalgamated: Gender, Ethnicity, and Class in the Baltimore Clothing Industry, 1899-1939 (Argersinger 1999) and Behind the Backlash: White Working-Class Politics in Baltimore, 1940-1980 (Durr 2003). MIHP HA-30, HA-376 through HA-378, HA-382. MIHP BA-150, BA-2350, BA-2368; see McGrain 1976. ASR 18BA197, MIHP BA-220, BA-221, BA-2231. Charles Steffen 1979. See ASR 18BA165. Because of the vast amount of information recorded in the Maryland Inventory of Historic Places about Baltimore City (it has almost twice as many individual recorded sites as the county with the highest number of the same), the method of gathering information was slightly modified. Instead of searching the MIHP files for every single labor-related site, which could have taken weeks, only survey districts and archaeological sites were canvassed. MIHP B-3714. Seth Rockman (1999) has written a dissertation on free and slave labor in late-18th-century Baltimore. This site straddles the border between Howard and Baltimore counties. The Ellicott’s Mills have been described in the sections on Baltimore County. ASR 18FR161, MIHP F-7-009, F-7-023, and F-7-120. ASR 18FR29, 18FR584, 18FR720, and MIHP F-6-045. Burnston 1981, Kelley and Angel 1983. Lanmon and Palmer 1976, ASR 18FR16, MIHP F-7-050. Lanmon and Palmer 1976:39,41, Lanmon et al. 1990:35, MIHP F-7-005, F-7-026, and F-7-120. MIHP F-1-077, F-1-182, F-2-001, F-2-009, F-2-046, F-4-044, F-5-015, F-5-116, F-6-050, F-6-070, F-8-042, and F-8-141. ASR 18MO368, MIHP M:23-065, M:23-069. ASR 18MO461, 18MO545, 18MO552; MIHP M:13-26, M:25-16, and M:31-05. A large number of mills located in Montgomery County are identified in a folder titled “Montgomery County Mill Forms,” filed with the county’s archaeological site forms. Because of the large number of mill sites and because many of them were no more than small custom grist mills, they will not be discussed here unless they also appear in the Maryland Inventory of Historic Properties. ASR 18MO101, MIHP M:17-52, and M:17-63. ASR 18HA93, MIHP HA-48, HA-1226. MIHP BA-2083 through BA-2086, BA-2209, BA-2810. ASR 18BA196, MIHP BA-150, BA-2368. ASR 18BA197, MIHP BA-220, BA-221, BA-2369 through BA-2372. Patapsco Valley State Park 2001. ASR 18BA119, 18BA326, 18BA357, 18BA504. MIHP BA-8, BA-151, BA-1574, BA-1580, BA-2399, BA-2582. ASR 18BA199, MIHP BA-248, BA-2376. ASR 18BA142, MIHP BA-191, BA-201, BA-202, BA-2448 through BA-2456. ASR 18BA175, MIHP BA-826 through BA-831, BA-969. Choma et al. 1977: Section 8. ASR 18BC95, MIHP B-3713, Weeks 1991. MIHP HO-042, HO-213, HO-215, HO-216, HO-223 through HO-225. Vera Filbey (1965) has written a history of Savage. MIHP HO-367 through HO-371, HO-377. ASR 18HO80, Beynon and Iron 1990:29-43, Seifert et al. 1994:10-20. MIHP CARR-1024, HO-124, and HO-751. Healan Barrow (1987) and Bill Hall (2001) have written histories of Sykesville. MIHP CARR-074, CARR-075, CARR-160, and CARR-1486. MIHP CARR-033, CARR-067, CARR-1029, and CARR-1494. ASR 18CR221, 18CR222; MIHP CARR-700. ASR 18MO32, 18MO101, MIHP M:17-52 through M:17-54, M:17-56, and M:17-63. ASR 18HA79, MIHP HA-199, HA-200. MIHP HA-949, HA-1748, Morris 1989. MIHP HA-1504 through HA-1515, HA-1716. Dundalk-Patapsco Neck Historical Society 1980:4-5, MIHP BA-1201. Dundalk-Patapsco Neck Historical Society 1980:5-7, MIHP BA-1219. John McGrain, an eminent local historian and amateur industrial archaeologist, has documented the many manufacturing villages of Baltimore County (McGrain 1985). MIHP BA-1529, BA-2223, BA-2408, BA-2545; Beirne 1979:182. ASR 18BA196, MIHP BA-150, BA-2089 through BA-2093, BA-2375. ASR 18BA142, MIHP BA-191, BA-830, BA-969. Goodwin et al. 1992:33, 39-40. This was actually one of a number of strikes by railroad workers all across the country during the late 1870s and 1880s (see Forbath 1991:66-71). MIHP HO-042, HO-213, HO-214, and HO-221. ASR 18HO86, 18HO99, 18HO111, 18HO151, 18HO153, and 18HO191. Beynon and Irion 1990:29-43, Seifert et al. 194:10-20. ASR 18HO108, 19HO109, MIHP HO-742. MIHP CARR-089, CARR-661, CARR-1029, CARR-1031, CARR-1032, CARR-1037, CARR-1065, CARR-1085, and CARR-1086. Weeks 1978:71, 76, 83, 88-89; MIHP CARR-424. MIHP F-1-029, F-1-062, F-1-077, F-1-118, and F-1-119. MIHP F-8-062, F-8-082, F-8-083, F-8-085, and F-8-122. MIHP M:21-002, M:21-151, M:21-153, M:21-157, and M:21-168. ASR 18MO485, 18MO506, and MIHP M:29-33. Dundalk-Patapsco Neck Historical Society 1980:13, 43, 47. Bill Barry, Community College of Baltimore County-Dundalk, pers. comm. 2003. MIHP B-1337, B-1341, B-1342, B-2784, B-3704, B-3714, B-3740, B-3994, B-4205, B-5058. Goodwin et al. 1992:53, Donovan 2001. MIHP B-3994; Kenneth Durr (2003) has recently produced a history of white labor unionism in Baltimore during the 20th century. Brauer and Jeppson 2002. Information about the ongoing program at the Oregon Furnace site can be found on-line at http://www.p-j.net/pjeppson/or/index.html. An analysis of the excavations at this site is presented by Gibb and Beisaw (2000a and 2000b). Archaeological reports on Texas sites are Brown et al. 1986, McFaden et al. 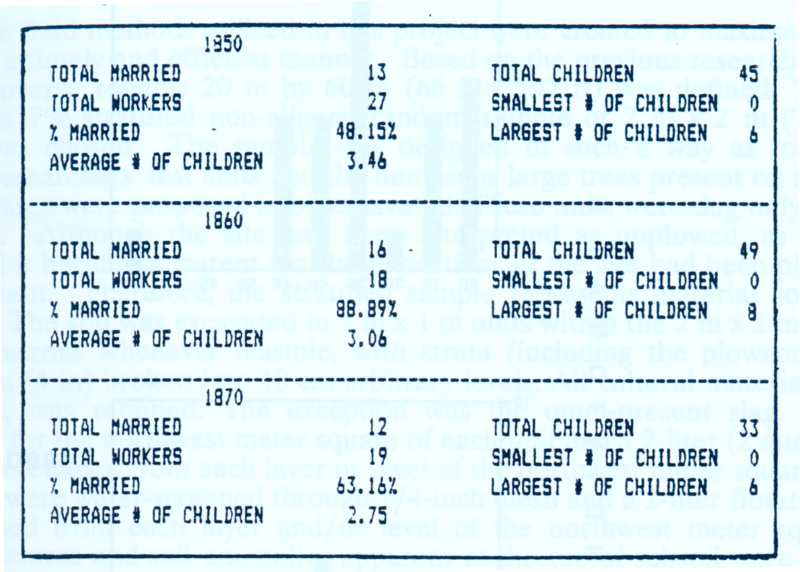 1988, Payne and Baumgardt 1987, and Payne and Baumgardt 1994. See page 41 of this report. The Union Mills Homestead Museum has a website at http://www.unionmills.org/ (Klein 2003). The Shellman House Museum has a website at http://www.carr.lib.md.us/hscc/property/Shellman.htm (Graybeal 2003). Thomas et al. 1991; see also Hoffman 1992. Sharon Ann Burnston (1981, 1997) has reported on the exhumation of these graves and their material culture. This physical analysis was reported by Kelley and Angel (1983).